New York Archives - Page 5 of 28 - Adventure, baby! Tacombi started out selling tacos out of converted VW bus in Playa del Carmen. 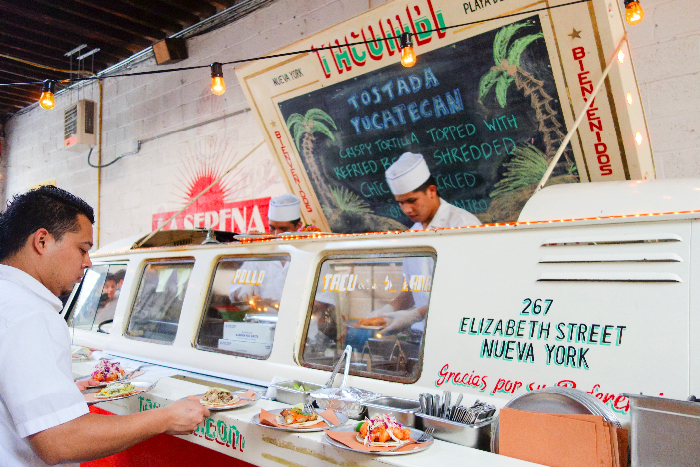 Now, comfortably parked in Nolita, Tacombi transports taco-lovers to the streets of Mexico by offering a piece of the Mexican beachside lifestyle set up in a garage just off Houston Street. 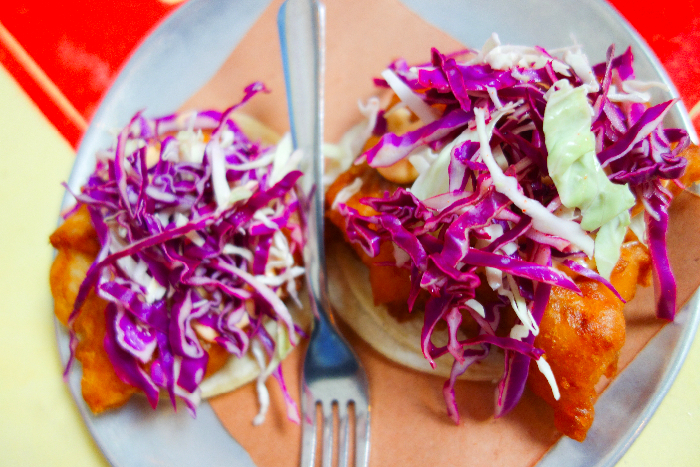 The food at Tacombi is prepared from scratch everyday, using fresh, wholesome ingredients to serve up the diversity of homestyle Mexican beach cuisine in a simple taco. For a largish party of six, we ordered a variety of the tacos on the menu. They have quite a few varieties, plus a dish called Corn Esquites ($3.95; toasted corn, lime, & chipotle mayo) that is a crowd pleaser. Each dish is pretty small. 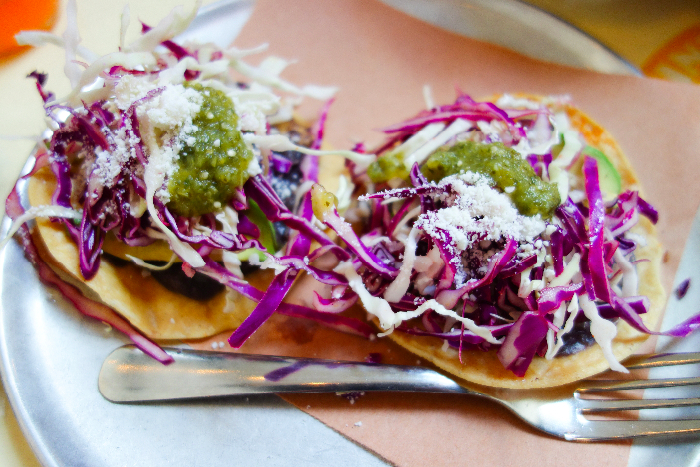 The restaurant advises having three tacos per person as an ideal portion. We ordered the Guacamole Con Totopos ($11.49) which was actually a star dish. 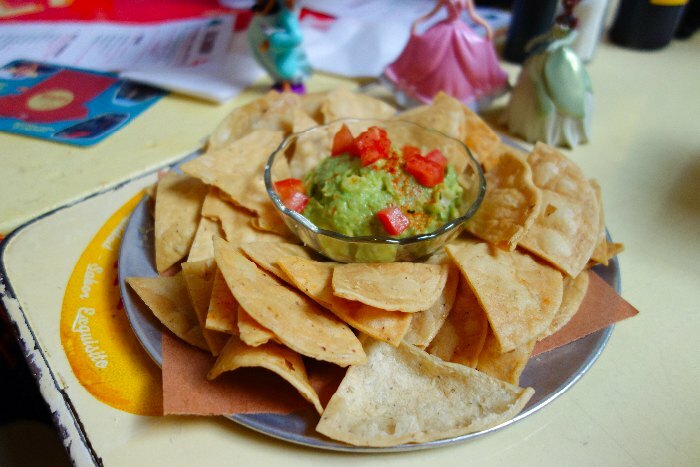 The tortilla chips look to have been made in house, and the guac was creamily divine. We had to order a second helping since it was so good. Our non-vegos ordered Crispy Fish tacos ($4.49 for two). My dish was the Tostada Del Amor ($4) which featured refried beans, avocado and cheese. Absolutely delicious, but I should have ordered another serving. 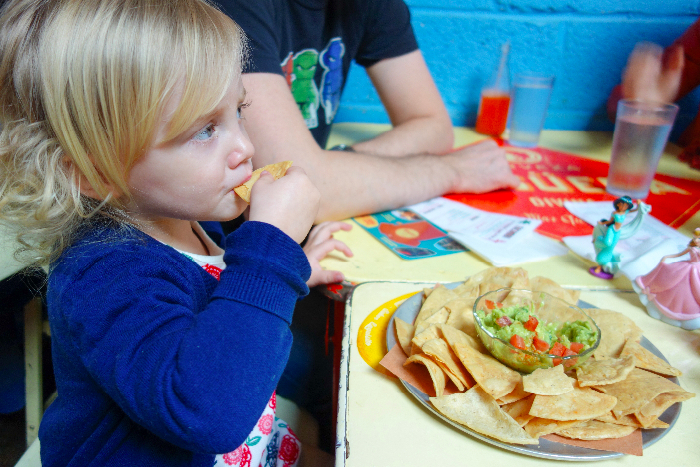 The beauty of Tacombi with kids is how entertaining it is for older toddlers and above. 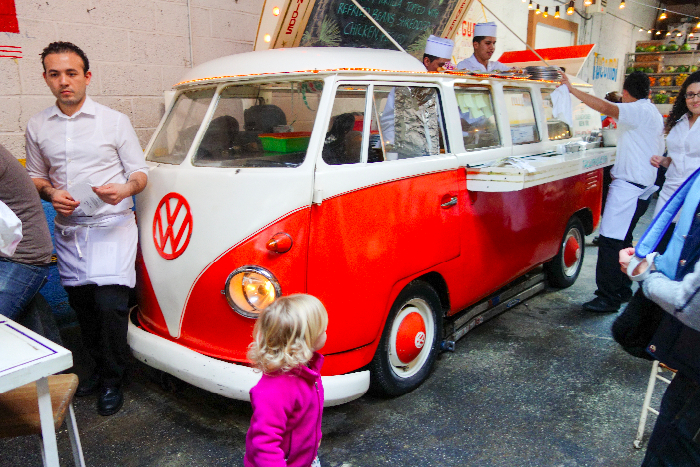 The big VW in the middle of the room is actually where the tacos are dished up, so not only is it fun for kids to run around looking at the car, they can also watch their food being made while they wait. The restaurant is a super casual, no-frills kinda place, which is also idea for taking little ones who aren’t good at sitting still and keeping food on their plates. 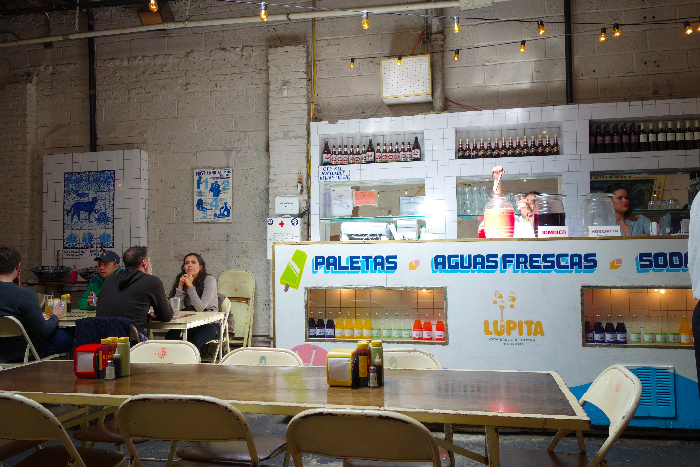 The taqueria is pretty big, but the wait is still long for a table, so arrive early and put your name down. They will seat incomplete parties, however, which was great for us as two of our friends were running super late, and we were still able to sit down and start ordering food. 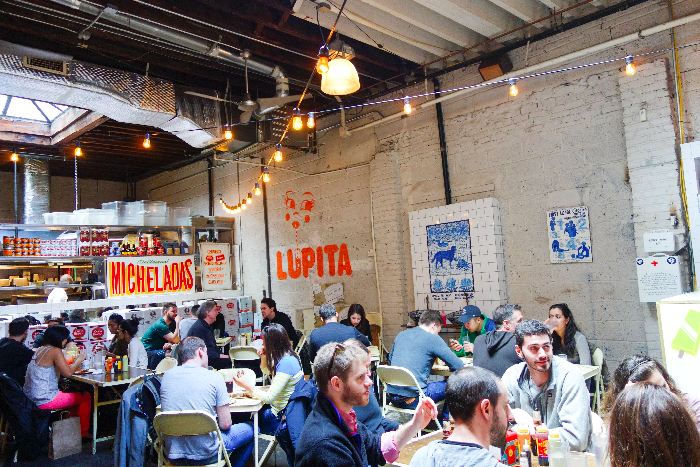 Last Bite: Tacombi serves up homestyle, beach-inspired Mexican cuisine in Nolita. Take friends on the prowl for a trendy lunch. Wriggly kids are welcome. 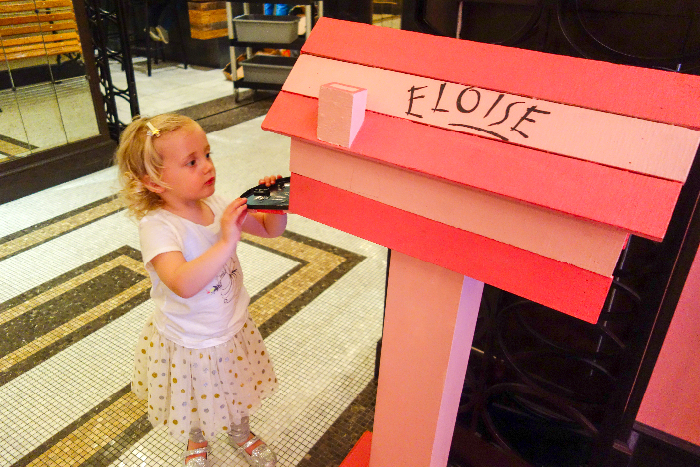 Ever since I arrived in New York, I’ve been dying to take my little girl to one of the special Eloise-themed events at The Plaza Hotel. 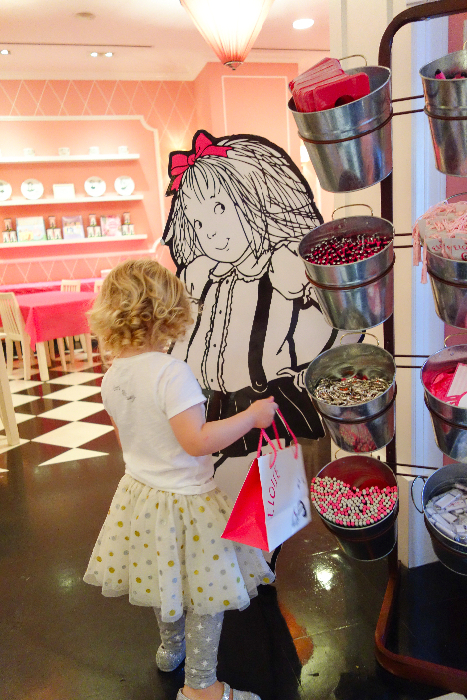 The Plaza pays homage to its most famous “resident” with a special Eloise suite, an Eloise afternoon tea at the Palm Court, and a series of special events run out of the Eloise Shop. 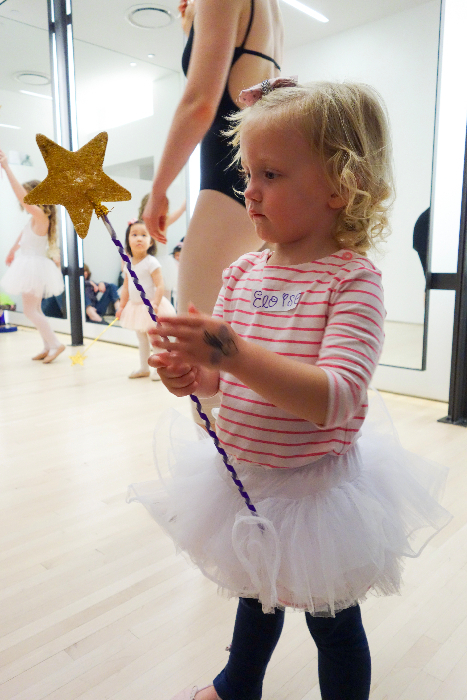 I’ve always thought my E was too young for the events, but when I saw the special ballet event, Creative Ballet with an Eloise Twist (for ages 3-5), I just couldn’t resist. The events are on the pricey side (this one was $75 for adult and child, for a one hour event), but I thought it could be a special outing for us both. 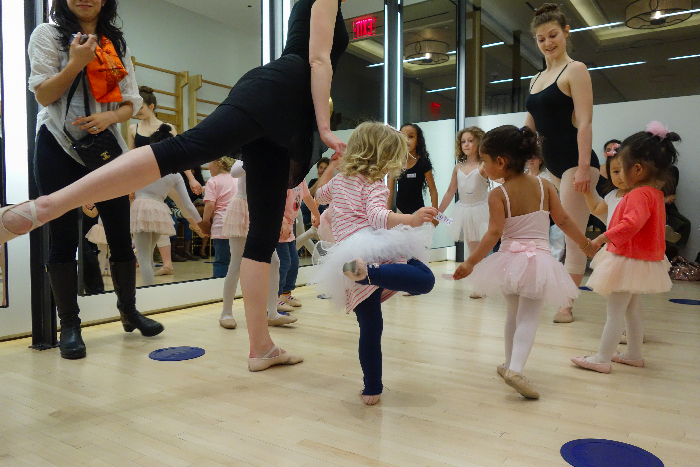 The ballet event included a 45 minute lesson followed by pink lemonade and treats, and a “mahvelous” ballet-inspired gift bag. 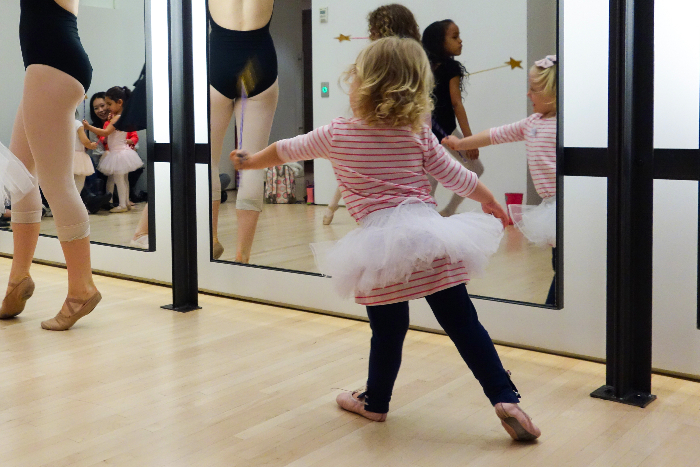 So on a rainy grey day, we dressed in our ballet finest (or one of us did, anyway), and joined other Eloise-loving ballet fans for a special class à la Eloise. 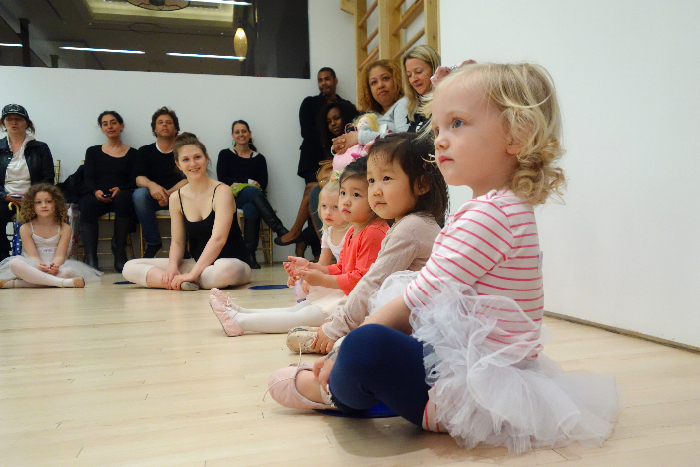 The class was completely adorable: Two teachers led a bevy of ballerinas through stretches, tendues and twirls, encouraging their imaginations with a fantasy journey through Central Park and flying like a butterfly. 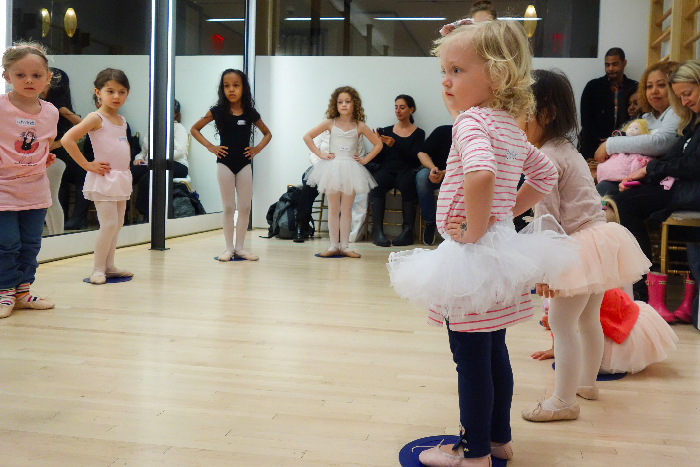 At a couple points during the class, my E had an attack of shyness (or nerves?) and freaked out a bit when she moved around the room and couldn’t see me anymore, which is so unlike her. The teachers couldn’t have been kinder or sweeter with her, gently encouraging her to join them, holding her hand, and including her in everything even when she was hiding in my lap. Following the ballet class was snack time. Usually this is held in the tea room within the Eloise store, but today it was booked for a party so we had our snacks in the main restaurant in the hotel instead. The atmosphere was just not the same, sadly. The kids were seated at too-tall tables and large, uncomfortable chairs that were totally unsuitable for little kids. 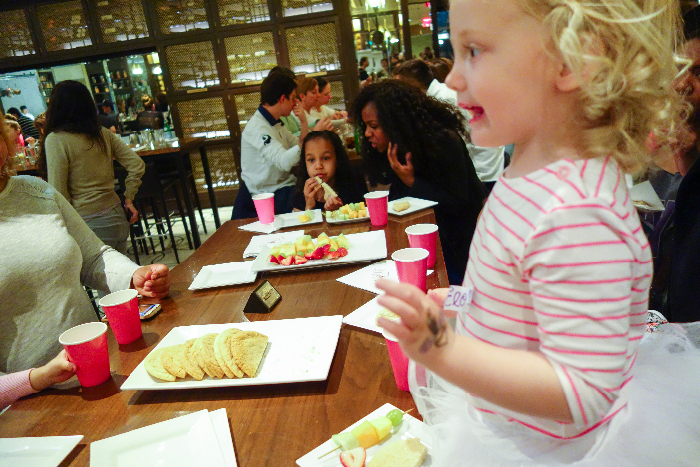 We were surrounded by adult diners enjoying their lunches, which meant that the kids had to sit still (uh-oh! ), talk quietly, and stay put (which, frankly, is very un-Eloise-like). The snacks were nice and simple, however: The menu included strawberry lemonade, fresh fruit skewers and sugar cookies. As we left, we were given our gift bag, which included a cute Eloise tee and water bottle. Before leaving I let E have a run around the Eloise store. She adores the baby grand piano — as do a lot of aspiring Eloise’s! There’s a new Shake Shack in town! Brooklynites rejoice, you can now grab a burger, fries, shake and concrete from the new DUMBO Shake Shack. 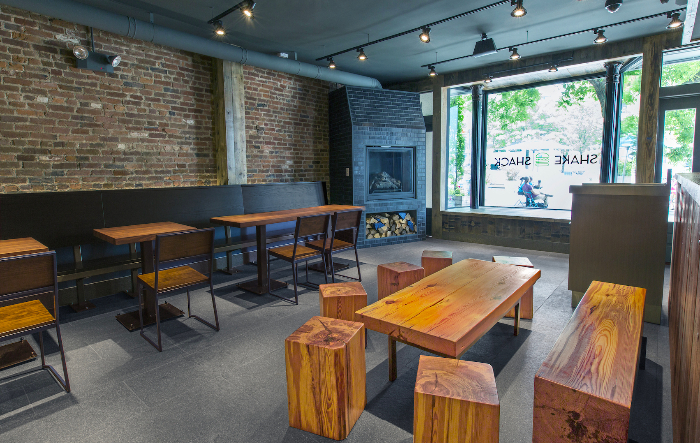 The newest Shake Shack opened today, featuring free wifi, a baby change table, and gorgeous handmade furniture by a local furniture maker (who is also a friend of ours!) Mark Jupiter. Look closely at the tables and lounge furniture – they’re made from factory beams salvaged from old buildings in DUMBO. The “Brooklyn Pie Oh My,” which is made from a slice of Four & Twenty Blackbirds pie blended with vanilla frozen custard. We’re told that the pie flavors will change, with the first one being strawberry-balsamic. The “Caramel Carousel” concrete is based on nearby Jane’s Carousel, and is made with vanilla frozen custard mixed with banana, sugar cone pieces, caramel sauce, and sea salt. The DUMBO Shack has partnered with Badass Brooklyn Animal Rescue, a non-profit network of volunteers that rescues, rehabilitates and finds homes for adoptable dogs from high kill shelters in the rural south. 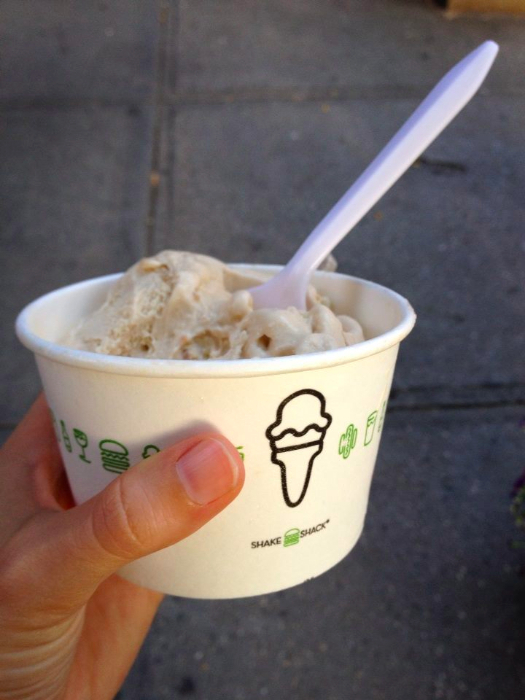 Five percent of sales from the Caramel Carousel concrete supports Badass Brooklyn. Isn’t that alone a reason to try the new concrete? 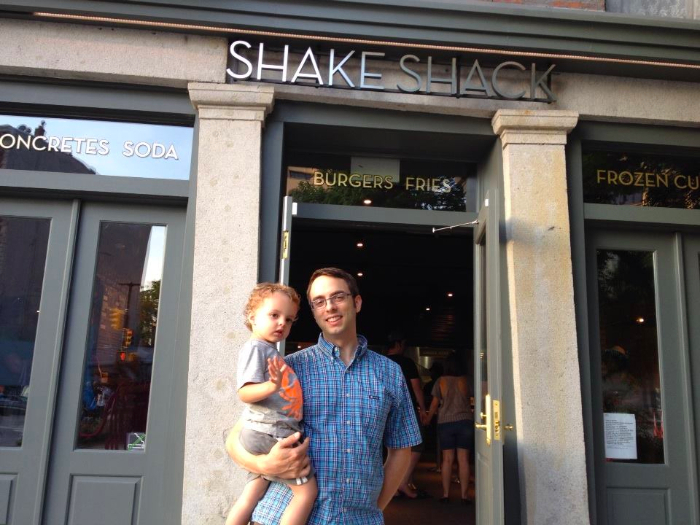 Thanks to Lindsey Turner for her pics of Shake Shack’s opening day! Will you be going to the new location too? Something I’ve been wanting to do for a long time is take little E to an Eloise-themed Rawther Fancy Tea Party at the Plaza Hotel. 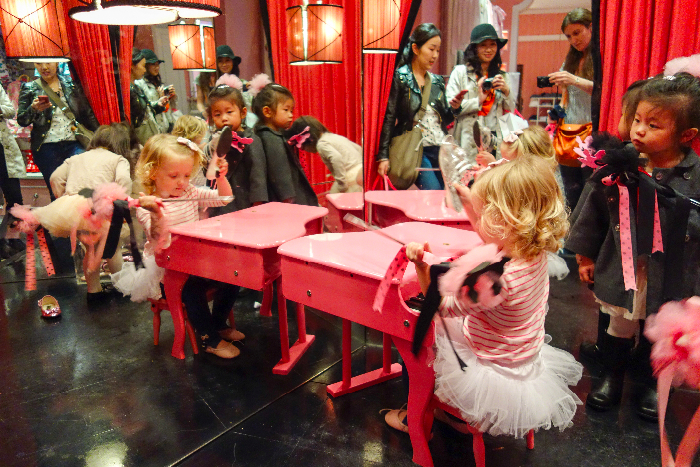 The Rawther Fancy Tea Parties are part of the special events run under the Plaza Hotel in the Eloise store. 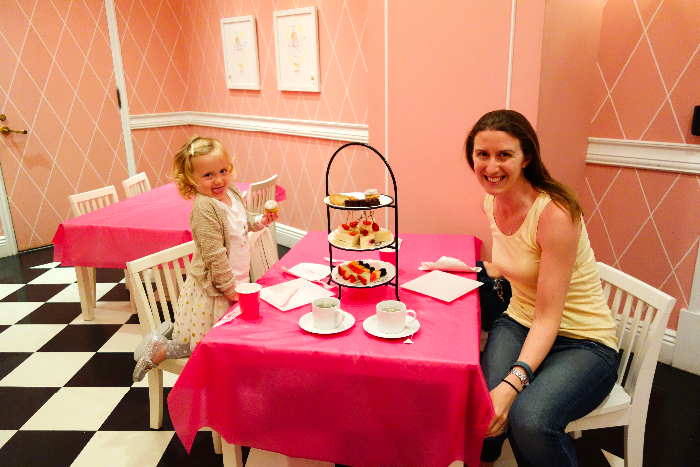 I ADORE the Eloise character and have been so excited to share her with my own Miss E. So it happened on a steamy, rainy Friday that the Little One and I found ourselves at the pinkest tea party that ever might be. Our host, Stephanie, made us feel extremely welcome. Stephanie ran the tea party for us, providing us with pink lemonade as well as real tea (E and I both had citrus chamomile). It was E’s first “real tea” and she flipped out when I gave it to her, because it made her feel like such a big girl to be drinking adult tea with mummy. Our afternoon tea delights arrived on a three-tiered platter of illustrated Eloise plates. The bottom plate held fruit skewers, the middle plate had sandwiches (egg salad, cream cheese and cucumber and peanut butter and jelly), and the on the top plate, sweets (mini cup cakes, chocolate brownie and choc chip cookies). Please excuse the terrible photo of the tea platter. E was SO EXCITED when it was placed in front of her that she photobombed me and I laughed so hard the camera shook. 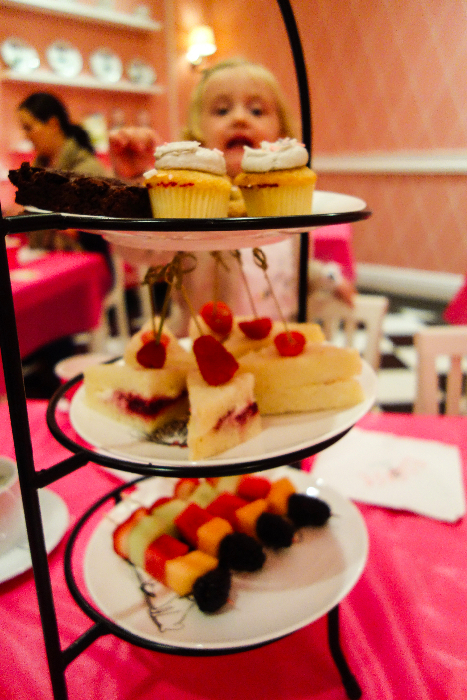 The Rawther Fancy Tea Party was held in the party room in the Eloise Store, which is under the Plaza Hotel, next to the Plaza Food Hall. 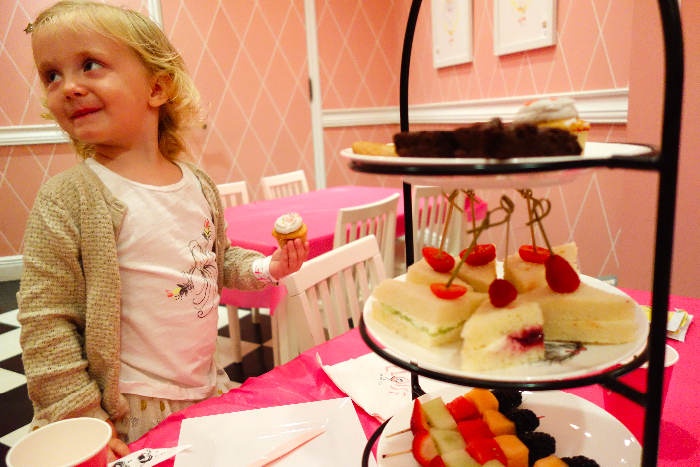 We’ve visited the store before on many occasions and E has always been attracted to the tiny chairs and tables — a perfect size for this little one to feel like a big girl, while at a very special tea party with kids her age in mind. E tried a little of everything, but particularly loved the mini cupcake and the fruit. I happily ate the sandwiches (LOVE me some tea sandwiches) and can report that they were delicious. The fruit was super fresh and tasty (they didn’t taste like the fruit had been sliced hours earlier, languishing in a fridge), and the baked goods were all kid-friendly crowd pleasers (it is hard to go wrong with cookies and brownies.) As often happens with me and tea, we couldn’t eat all the sweets so we had them boxed up to take home. Our fellow tea party goers were girls of similar age, along with their mum or mum plus an out of town friend. After our tea party we all wrote letters to Eloise. Stephanie told us that Eloise always writes back, so we’re very excited to receive a special letter in the mail. Miss E “wrote” her letter in some beautiful swirly drawings, at the end of which I added that we loved our tea party and wished Eloise had been able to make it. The letters were all posted in the appointed Eloise mail box, ready for delivery upstairs to the Plaza’s most famous resident. E loved posting the letter so much that she took out everyone else’s letters and reposted them all several times. Next came story time. Stephanie read two shorter Eloise books to the party in the back room of the Eloise store, while we lounged on the bright pink ottomans. And then the party was over! 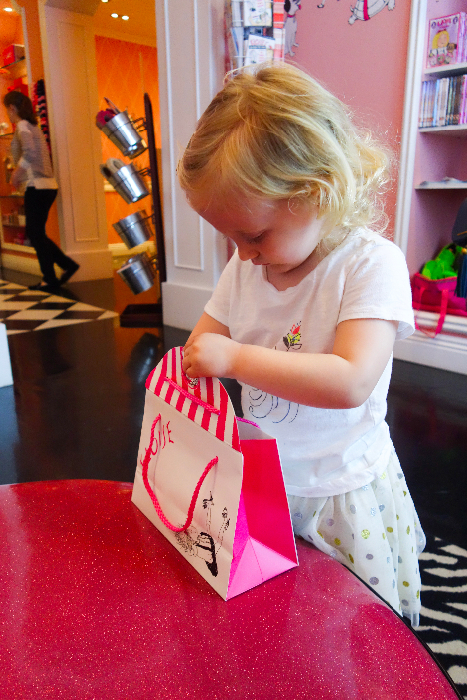 Each child received a gift bag containing an Eloise pencil, postcard, mints, gift voucher to the store, and a book. 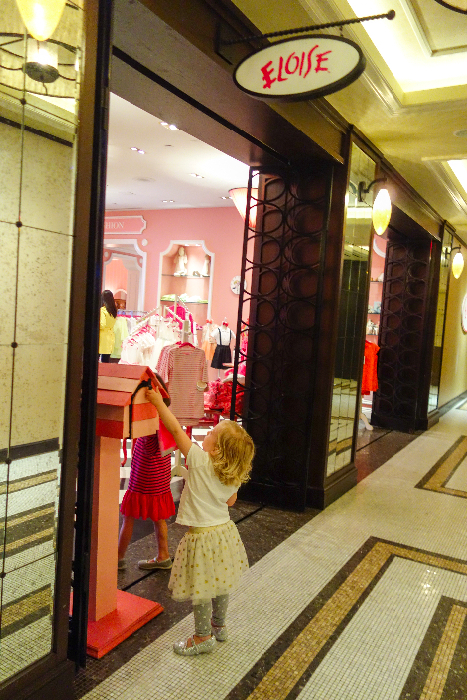 We shopped around, said “hello!” to Eloise, and went home. We love, love, love a tea party! Thanks Eloise and The Plaza! Rawther Fancy Tea Parties are held on Friday at 4pm at the Plaza Hotel. Cost is $100 for an adult and child pair. Reservations are required. 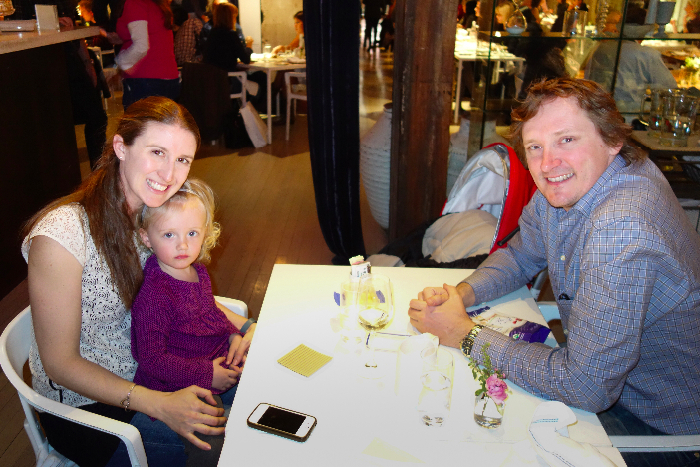 For the husband’s big 40th birthday, I decided to spoil him with lunch at ABC Kitchen. With Chef Jean-Georges Vongerichten at the helm, I knew we were going to be in for a great dining experience. The restaurant is situated in the ABC Home store near Union Square. 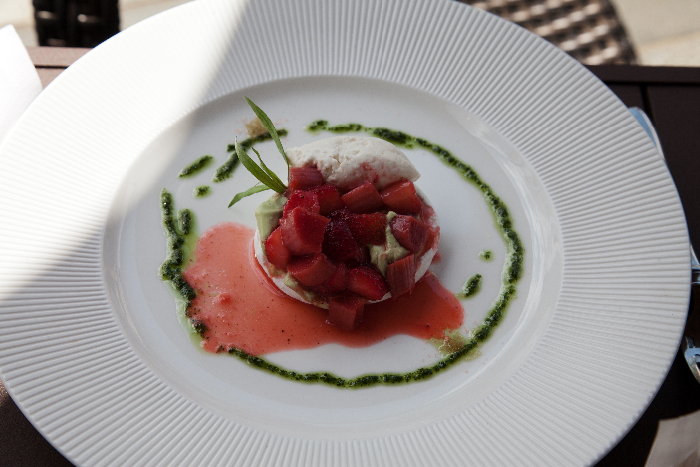 They have a seasonal menu with fresh, locally-sourced ingredients (where possible). Their menu alignes with the farm-to-table movement, and is free of pesticides, synthetic fertilizers, insecticides, antibiotics and hormones. All of the food at ABC Kitchen is also GMO-free, and naturally and humanely sourced from regional farmers and fair trade cooperatives. 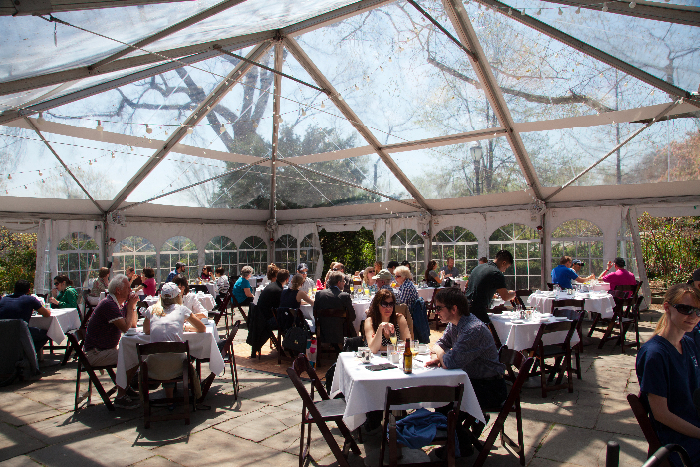 The restaurant celebrates community and the future of the slow food movement. 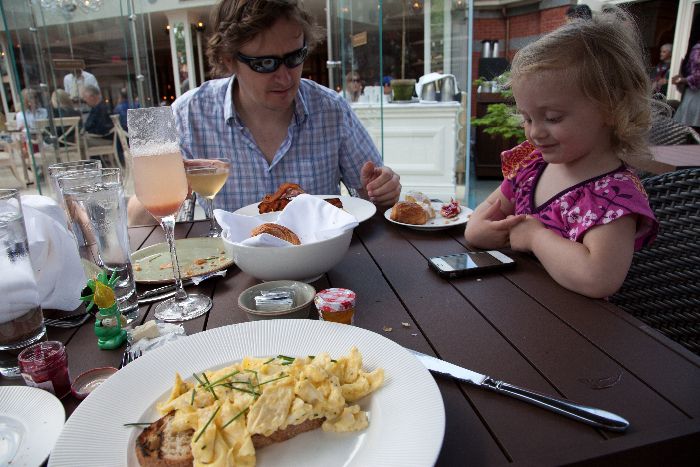 Taking a toddler to a fancy lunch is always risky. I planned this lunch to get wiggly E to nap in her stroller on the way so we could get through at least part of lunch before she woke up. The staff couldn’t have been sweeter, finding us a table that accommodated our sleeping toddler in her stroller, and had a place set for her upon her awakening. In the best birthday gift of all time, E slept right through lunch, waking up when dessert was served. A happy birthday to Daddy indeed! 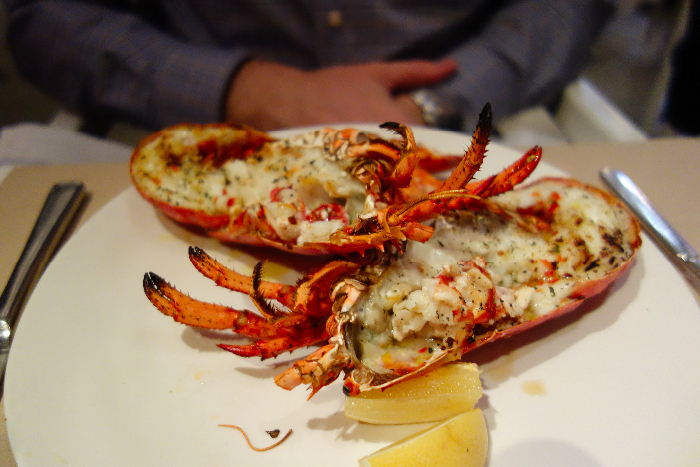 Since it was his birthday, Alec ordered the Wood Oven Roasted Maine Lobster with Oregano and Lemon-Chili Vinaigrette ($39). It was his first lobster ever, and he proclaimed it delicious. 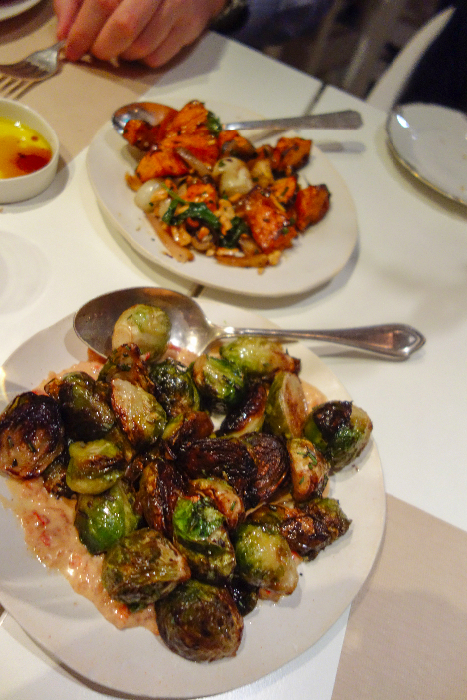 Together, we shared a few smaller dishes: Roasted Kabocha Squash Toast with Fresh Ricotta and Apple Cider Vinegar ($12), Roasted Brussels Sprouts with Mustard Vinaigrette ($11) and Roasted Sweet Potatoes with Cipollinis, Cashews and Maple Syrup ($10). The roasted squash toast was probably my favourite – I absolutely love the combination of ricotta and roasted squash. The flavors go together perfectly. I wasn’t a huge fan of the brussels sprouts – I found they were a bit bitter for my liking when paired with the mustard vinaigrette. Alec’s favorite was the roasted sweet potatoes with a hint of heat to them. 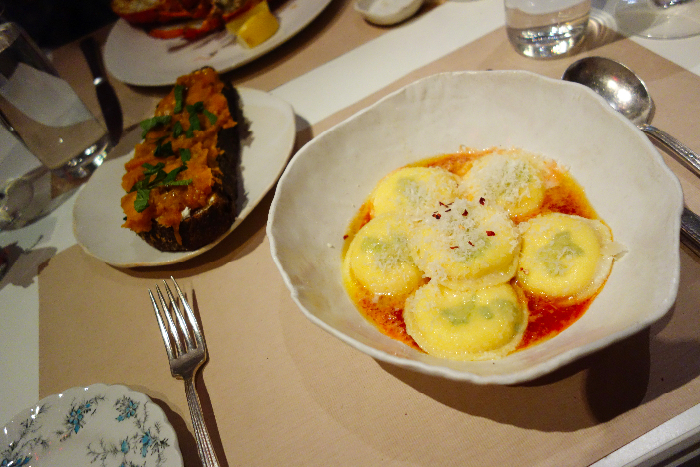 For my main I had the Housemade Ricotta Ravioli with Herbs and Tomato Sauce ($23). It was absolutely delicious. Big fluffy pillows of pasta stuffed with creamy ricotta, and in a perfect tomato sauce. For dessert we ordered the special, which, to be honest, I’ve forgotten what it was called (clearly not memorable! 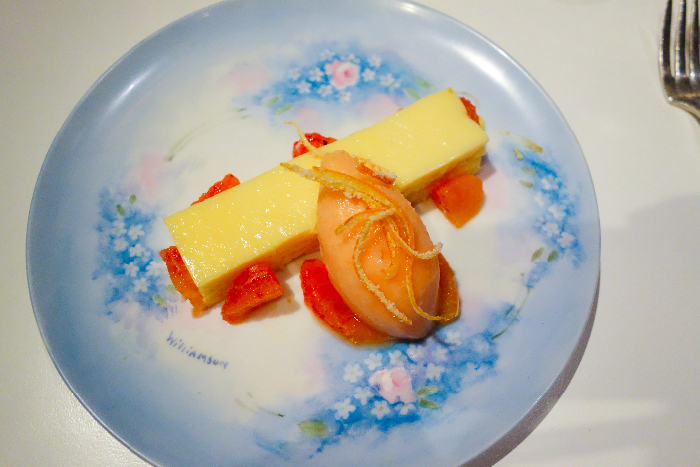 ), and the Orange “Creamsicle” Tart ($10). 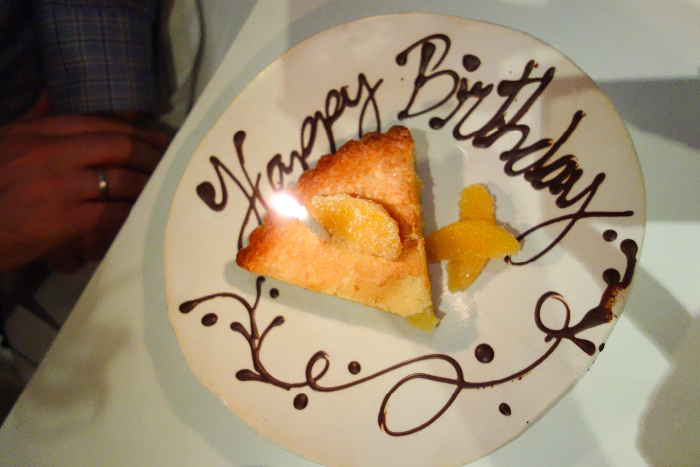 The sweet staff put a candle in Alec’s dish and wrote a big “Happy Birthday!” on it in chocolate. With Little E to help him blow out the candle, Alec proclaimed it the perfect birthday lunch. After eating we adjourned to nearby Union Square for play time. 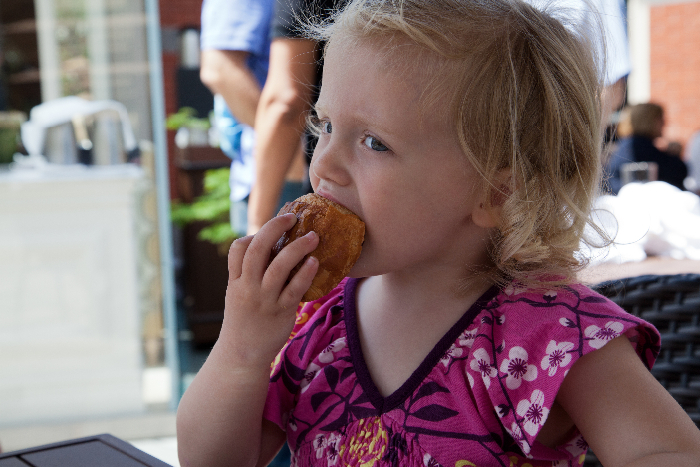 Last Bite: High-end dining where kids are welcome. Reserve a table in advance so there’s no wait. Three years ago, I flew to New York alone, and four months pregnant. Meeting Alec at the airport I was apprehensive, scared, extremely nauseous, and not sure that we’d made the right decision. The years that followed were the hardest, most challenging, most frustrating years of my life thus far – compounded a million by having a baby in a country far from our family. But in the middle of these difficult years, something extraordinary happened. 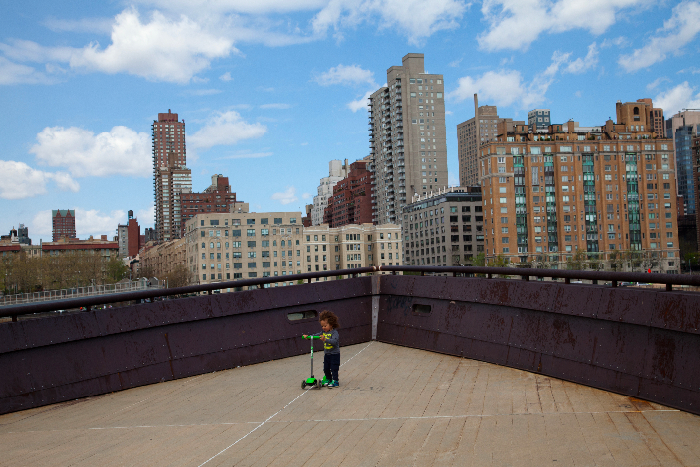 We created a tiny New Yorker and made a home in this big crazy city. We explored. We dreamed big. We discovered what we were truly capable of when faced with adversity. New York is a hard place to live. It’s fast, it’s dirty, it’s expensive. It’s also aggressive, strong and fierce. Each day can be like a battlefield – just taking a subway ride solo with a small child requires serious commitment and resolve. I learned a lot about myself thanks to this tough city. That I, too, can be tough, resilient and resourceful. That I’m capable of starting over in a new country, of making so many wonderful friends. Living in this city plus motherhood broke me down, and built me back up again into a person who is more confident, more certain of her own worth, and who is happier with who she is than ever before. Thank you New York for toughening up this soft girl from Sydney suburbia. Saying goodbye is something I don’t want to be doing. It feels too soon, too unfinished. But things don’t always go to plan, and our priorities have changed. Alec, Cheese and I will be returning for a time to Sydney to be closer to our families. We feel that it’s the right thing for us to do at this time in all of our lives, and we are embracing this decision while walking away from a life we also love passionately. Something I’m finding really hard to do. We are beyond lucky that we have such a wonderful life to return to back in Australia. Family and friends whom we love, and a country where it’s truly great to live. So goodbye (for now) to the piles of garbage on the sidewalk. To the smell of dog pee and sticky pavements in summer. To rats, lunatics and rappers in the subway, polar vortexes and hurricanes. So long to loving friends who embraced us into their lives. To Cheese’s playmates since birth. To tulips and daffodils in the spring, and fields of orange and red leaves in the fall. 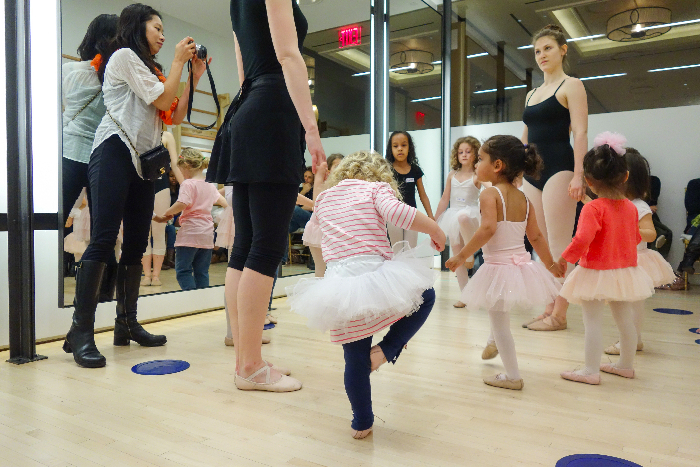 To carousels and whoopie pies, Broadway and world-class ballet. Goodbye to a life we loved, and hello to a brand new chapter for us all. New York, we love you, and we will see you again soon. 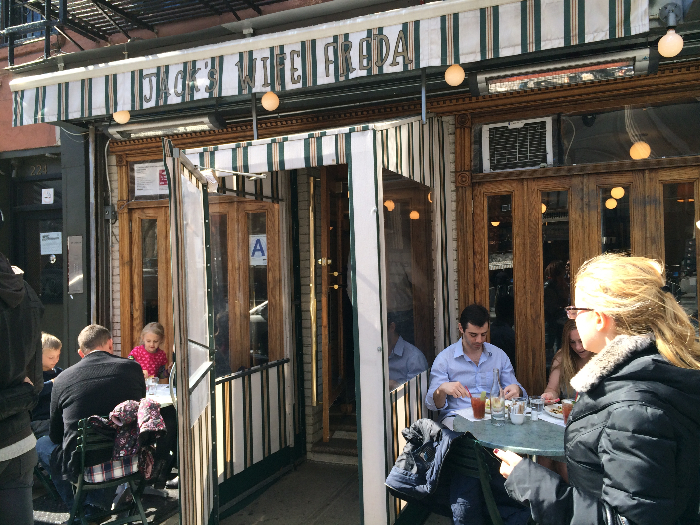 On what can only be called a crazy whim, we decided to brunch at Jack’s Wife Freda on an early spring morning. The wait for this restaurant is always out of control. We put our name down and went shopping during the hour and a half it took for our table to free up. The restaurant is absolutely tiny, and the tables are small and squished together. Not much room for baby stuff, so pack light and be prepared to leave the stroller outside. 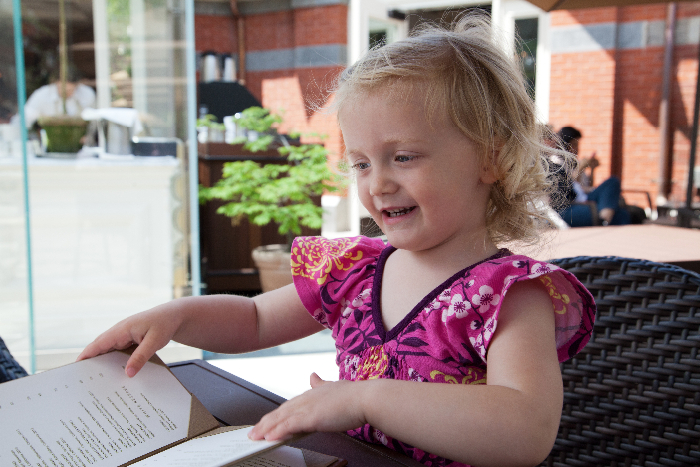 What the restaurant lacks in certain kid-friendly accommodations, it makes up for in its friendly atmosphere: The staff were incredibly friendly (our server was a fellow Aussie!) 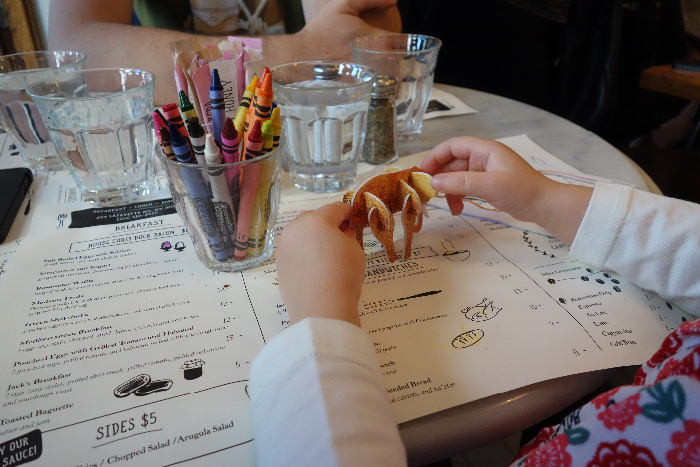 and obligingly gave Missy E crayons to color in with, as well as a really cool pop out 3D elephant puzzle that entertained her for the majority of the time we were there. There is a reason people line up for hours to get in: The food is absolutely delicious. 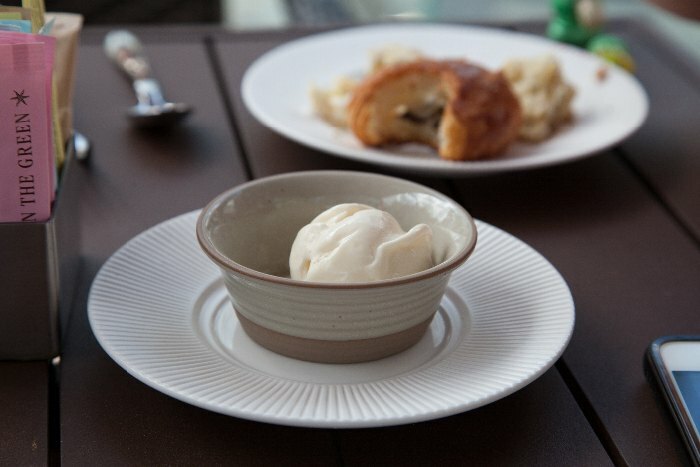 The dishes are small, so order a few sides if you’ve been waiting for a while for your table. 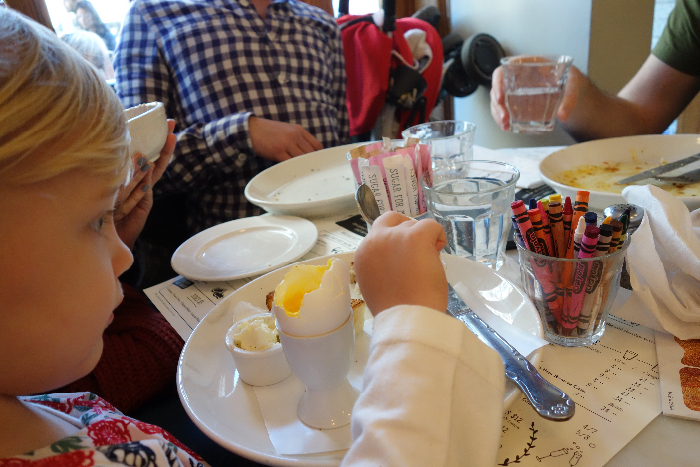 We ordered the Soft Boiled Eggs with Soldiers ($7) for missy E, Poached Eggs with Grilled Tomato and Haloumi ($12) for the three of us in our our party, and the French Fries ($5). 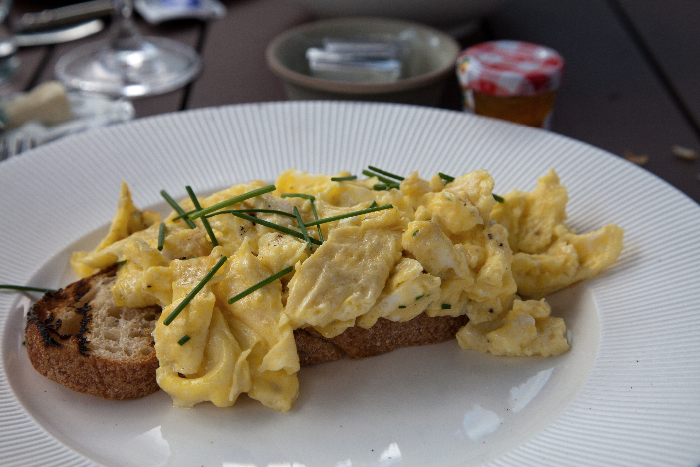 Perfectly cooked eggs, great bread, fragrant tomatoes. Absolutely delicious. 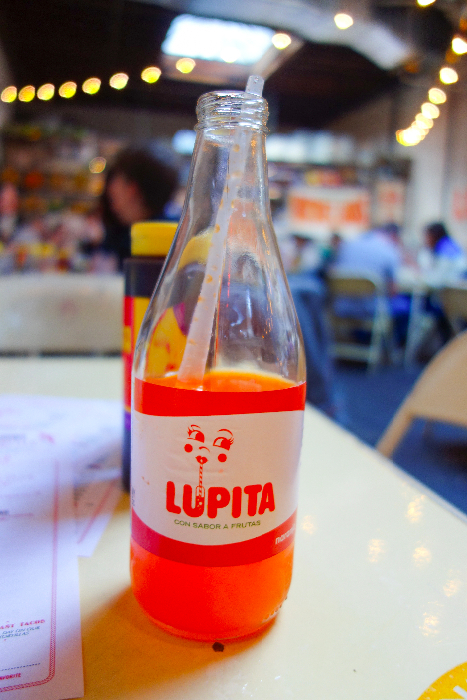 Last Bite: Arrive when it opens for a better chance of a shorter wait, or put your name down and enjoy shopping in Soho. 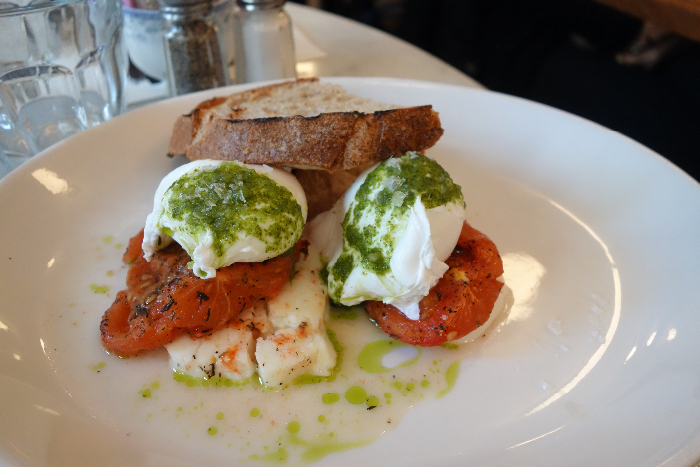 Your brunch will be worth it when you finally get it! A long time ago, two Australians visited New York City while on holiday. They had a romantic lunch at Tavern on the Green, oohed and aahed at the over-the-top Versailles-like decor, then went on their merry journey. They got engaged, then married, and then, finally, moved to New York City and had an adorable (albeit crazy) toddler. 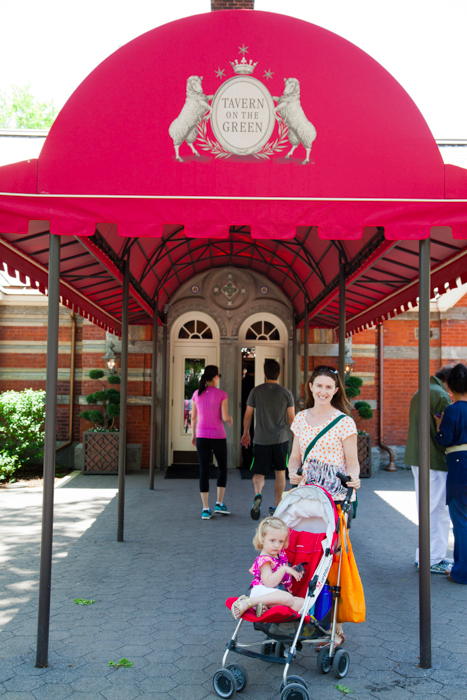 All the while, Tavern on the Green was on its own journey. 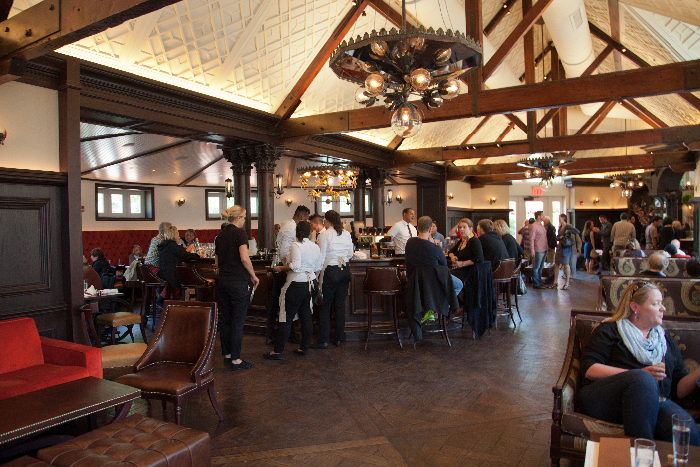 Tavern was originally built to hold the sheep that lived in the Central Park Sheep Meadow. In the early 1930s, New Yorkers evicted the sheep, and the building was converted into a restaurant. The restaurant became famous for its decadent Crystal Room, a conservatory-like space decked out with colored-glass chandeliers, stucco embellishments on the ceiling, and numerous flower motifs. In the restaurant’s hey day, during the late 1970s and ’80s, Tavern was the place for celebrities to be seen. John Lennon and Yoko Ono, Madonna and Michael Jackson were all guests. In 2009, the owners of Tavern filed for bankruptcy and the restaurant closed its doors, opening again in April 2014 after a massive refurbishment. The new restaurant barely resembles the old one. Gone is the Crystal Room and abundance of flowers. 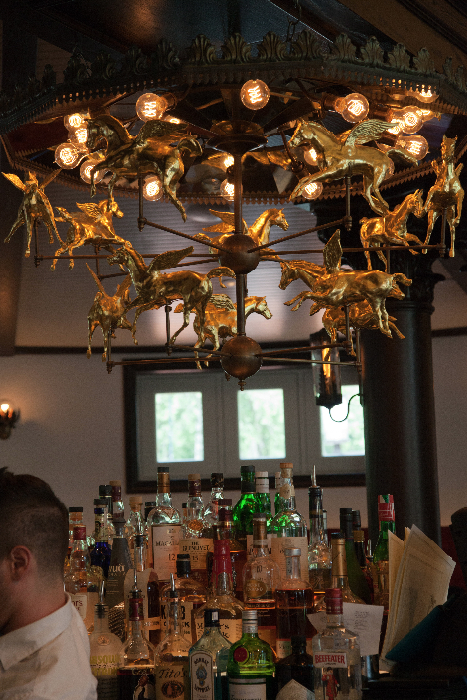 In its place is a sleek, modern dining establishment with nods to its heritage, such as sheep heads by the fire place, and a carousel-resembling chandelier over the bar. And so it was that this little family of three made their way back to the newly opened Tavern on an absolutely gorgeous spring day. Let me say this from the outset: the new Tavern has amazing staff. The efficient, friendly staff welcomed our wriggly toddler and her tired parents with open arms, and gave us a wonderful table in the courtyard. We ordered Assorted Pastries with Cultured Vermont Butter and Preserves ($6) which contained two perfectly-sized plain croissants, two chocolate croissants, a lemon poppy seed scone, butter, and orange marmalade and raspberry jam by my favorite jam-makers, Bonne Maman. We had intended these for Missy E, but they were so good we all devoured them. Alec and I both ordered the same dish off the brunch menu: the Scrambled Local Eggs with Fresh Goat Cheese and Chives with Applewood Smoked Bacon and a Sourdough Bruschetta ($21). It came with bacon, which I received on the side and added to Alec’s eggs. We added cocktails to the brunch (what’s brunch without a cocktail?) and were delighted to receive strong, well-made White Peach Bellinis and Brooklyn. 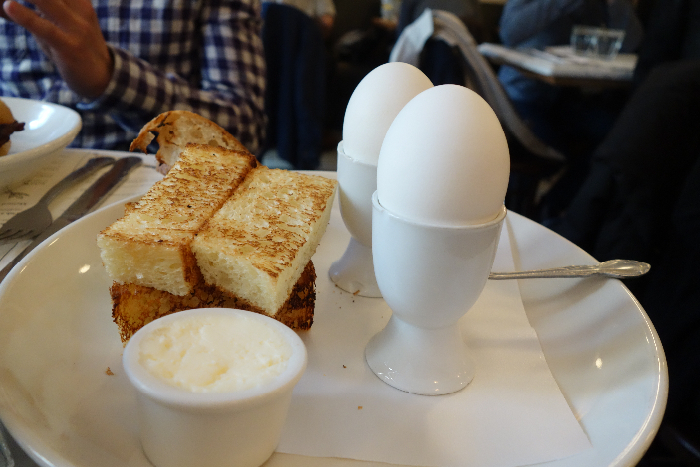 Our eggs on toast were really tasty – fluffy eggs on sourdough, as described. Even better — the meals all came quickly, before Missy E got totally bored. We even went back for dessert – a Brownie Sundae for me, with Fudge Brownie, Caramel Ice Cream, Homemade ”Cracker Jacks”, Chocolate Sauce ($13), the Spring Pavlova for Alec, with Matcha Curd, Macerated Strawberries and Rhubarb, Chantilly Cream, Tarragon Oil ($12), and a single scoop of vanilla ice cream for E.
My brownie was rich and moist, but I would have liked a bit more ice cream to go with it. 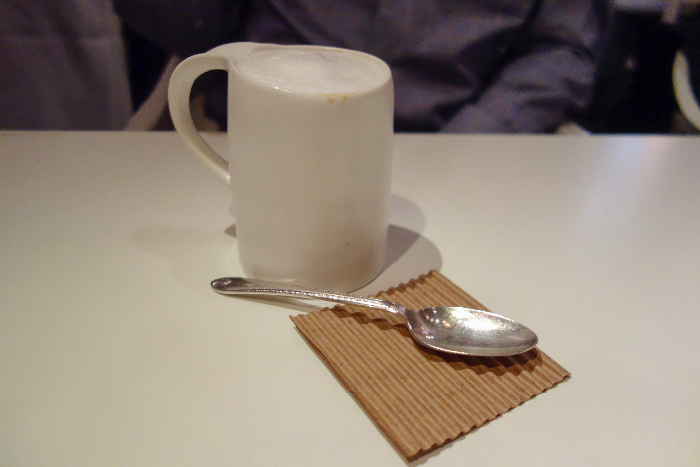 I really enjoyed the caramel ice cream however – it tasted like a salted caramel. Alec enjoyed his pavlova, but declared it nothing extraordinary. I think as Australians we’re spoiled by the amazing home-cooked pavs we’re used to back in Sydney! After our lunch, we took a little tour around the restaurant to check it all out. I really liked the bar area with the big booths, so Central Park-goers can drop in just for a casual drink, but still be comfortable. I saw a lot of families with smaller kids in this area — a great idea when you want to stop somewhere nice in the afternoon, but know your kids can’t handle full table service. 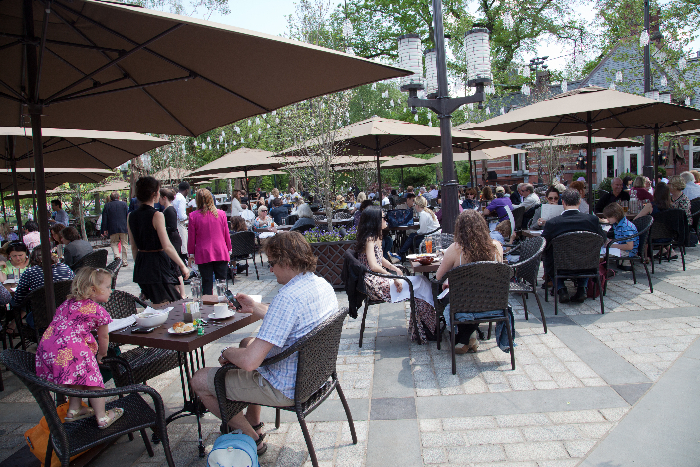 Last Bite: A great dining option in Central Park for families. 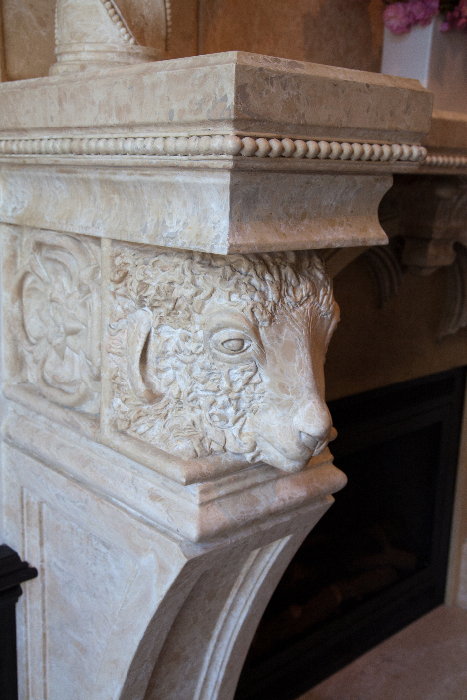 Friendly staff make this an enjoyable outing — just be sure to make reservations first. 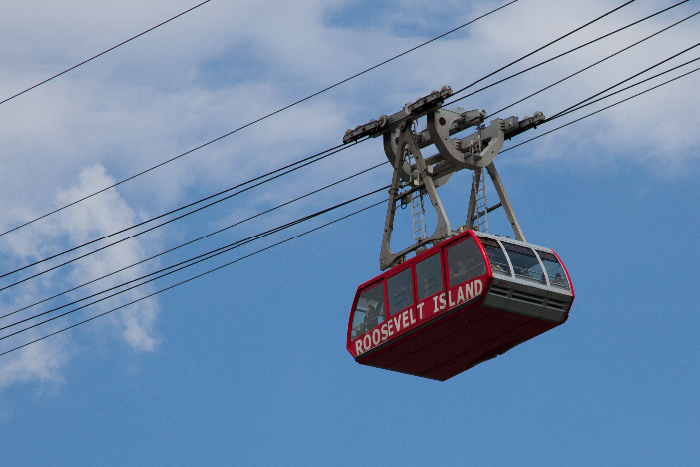 For a sunny-day outing that’s out of your regular routine, catch the sky tram to Roosevelt Island. 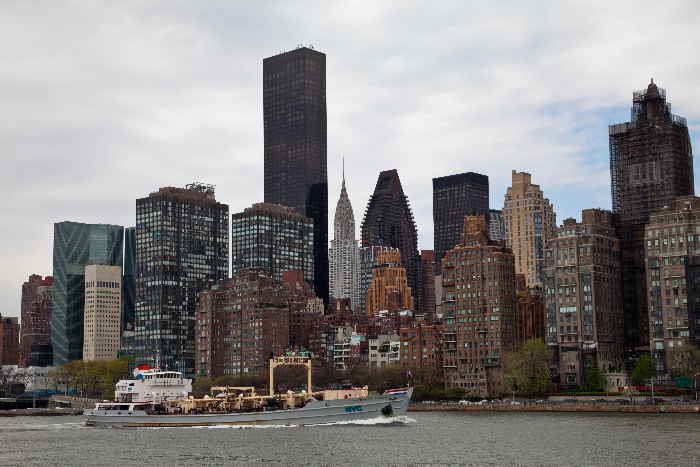 This narrow island is situated in New York City’s East River, between Manhattan and Queens. 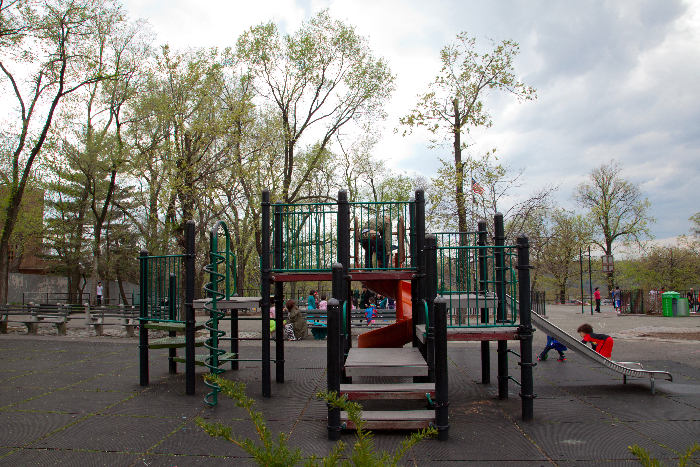 It’s a tiny island, running from Manhattan’s East 46th to East 85th Streets, and is only about 2 miles (3.2 km) long, making it an easily conquerable size for a fun day trip with young kids. Getting there is also a cinch (and fun!). You can either catch the F train directly there, or (our preference), get off the train at Lexington and ride the sky tram from 60th st and 2nd ave. The tram costs the same as a subway ride and comes around every 10 mins, even on weekends. It’s a gorgeous view of the city, so grab a window spot. There are elevators on both ends (strollers welcome!). 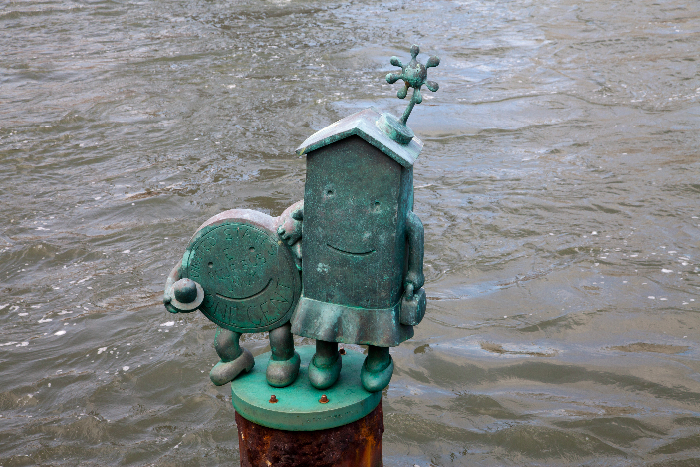 Stroll along the western promenade and look down to see Tom Otterness’ The Marriage Of Real Estate And Money Sculptures. Bring the scooters — it’s flat and smooth, and you can scoot around the entire island. Options for eateries on the island are slim. If it’s lovely out, either throw down a blanket anywhere on the lawn (under the cherry blossom trees is popular), or use the free bbq facilities next to the western promenade. There’s even a playground attached. At the northernmost end of the island sits a small lighthouse. 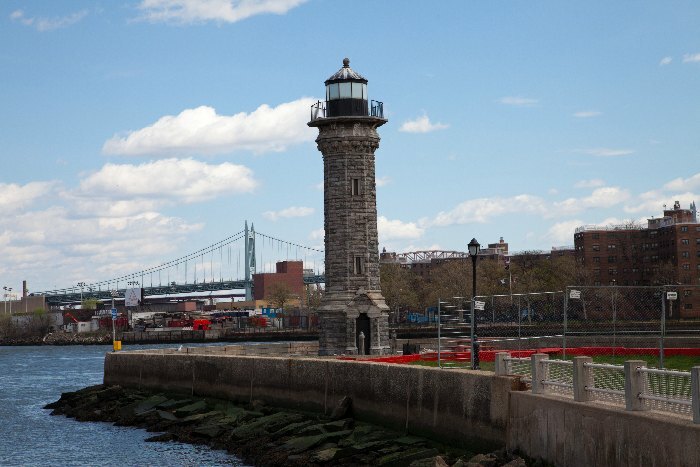 The lighthouse was built in 1872 and is around 50 feet tall. 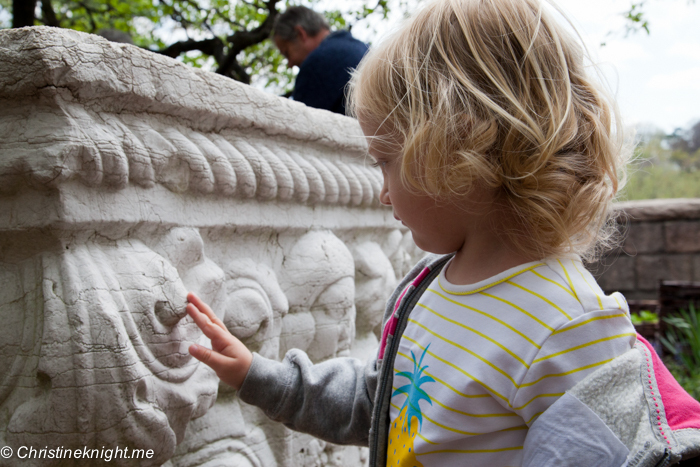 A cool spot to check out, especially for your boat-loving kiddo. Not enough energy expended strolling around the island? 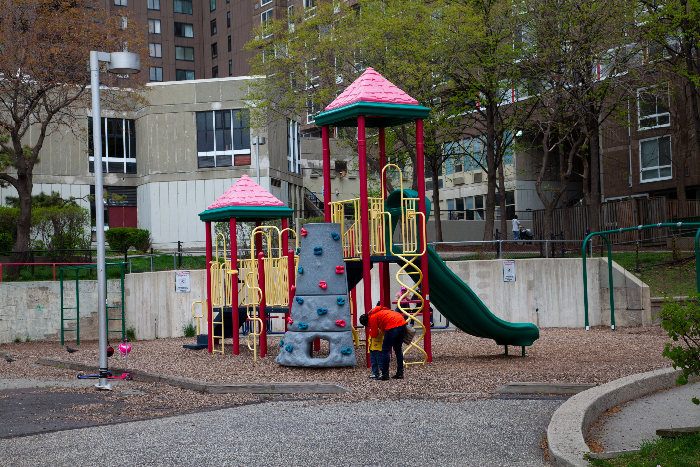 There are plenty of playgrounds dotted around the walking paths. 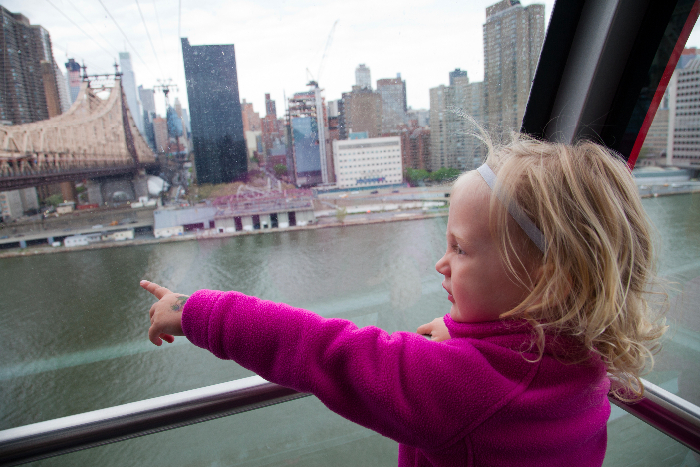 From the south end of the island, you’ll get an amazing view of midtown Manhattan. Like haunted ruins? 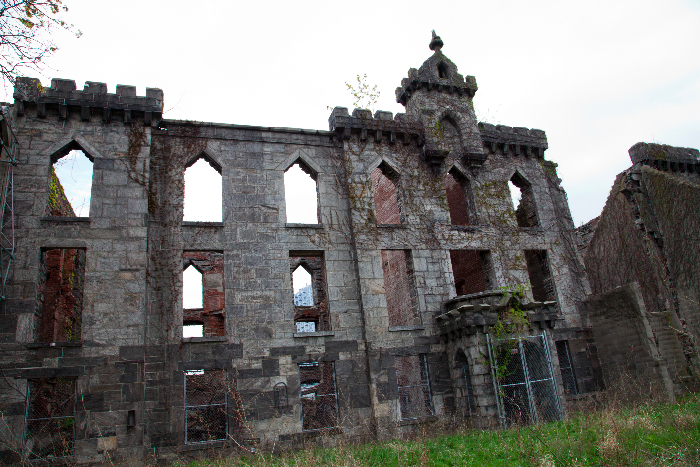 Check out the Smallpox Hospital at the southern tip. The hospital opened in 1856, and closed a century later, after which it fell into disrepair. In 1972 it was listed on the National Register of Historic Places and was designated a New York City Landmark four years later. The ruins will be open to the public after the current $4.5 million stabilization project is completed. 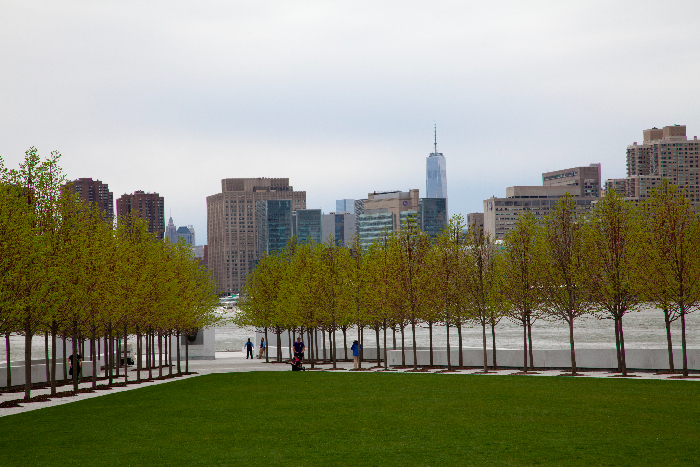 The Franklin D. Roosevelt Four Freedoms Park is a four-acre memorial to Franklin D. Roosevelt. Opening in 2012, it celebrates the “Four Freedoms” that Roosevelt spoke of in his 1941 State of the Union address. 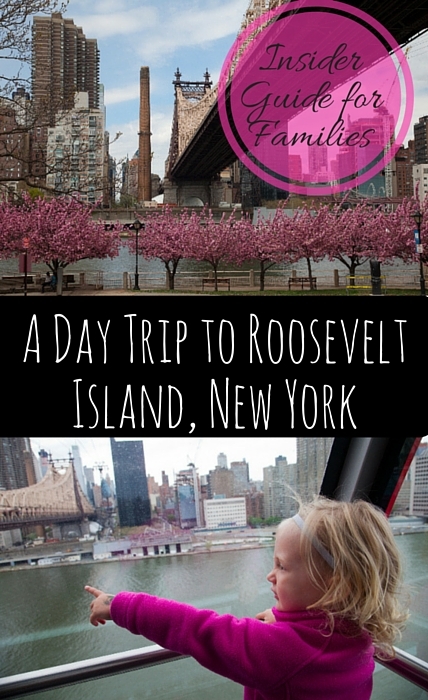 At the southern tip of the island you can say “hi” to Roosevelt’s bust. 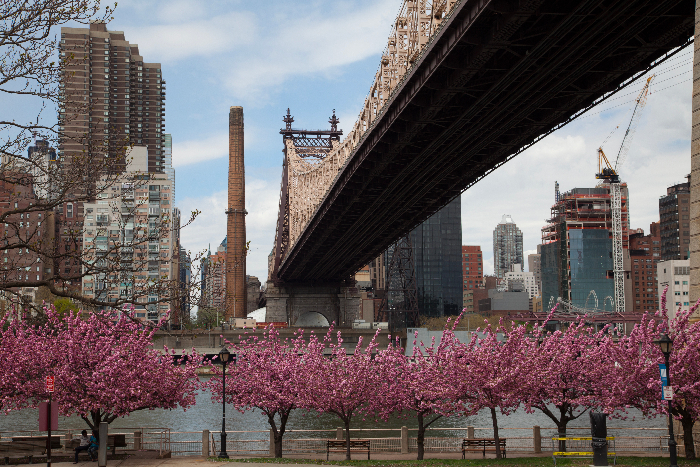 Visit in early May for spectacular blooms along the promenade. 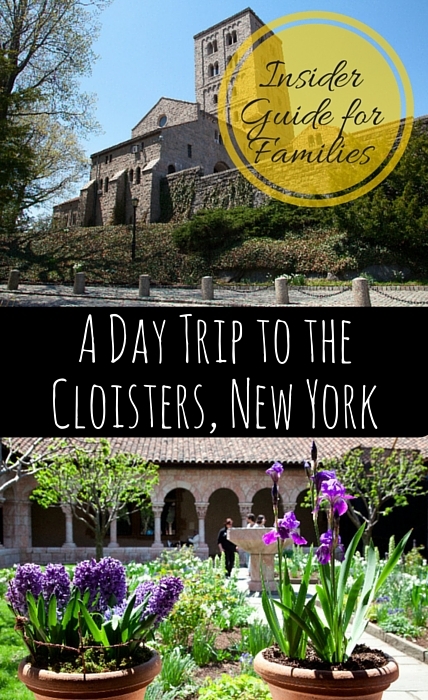 During the warmer months, a perfect family day trip is just north of the city at The Cloisters. 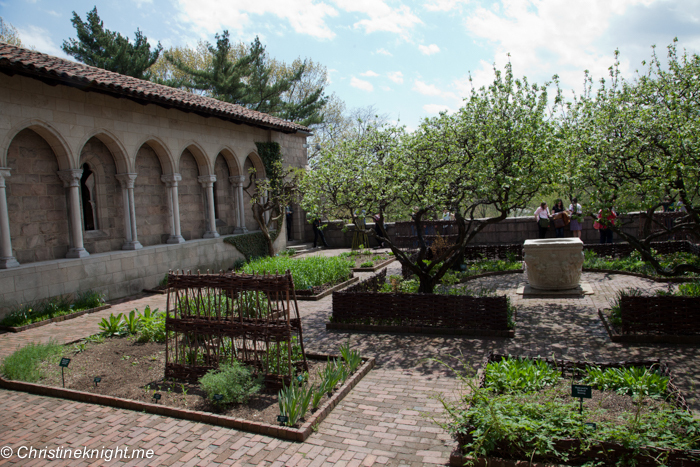 The Cloisters museum and gardens is the branch of The Metropolitan Museum of Art devoted to medieval European art and architecture. 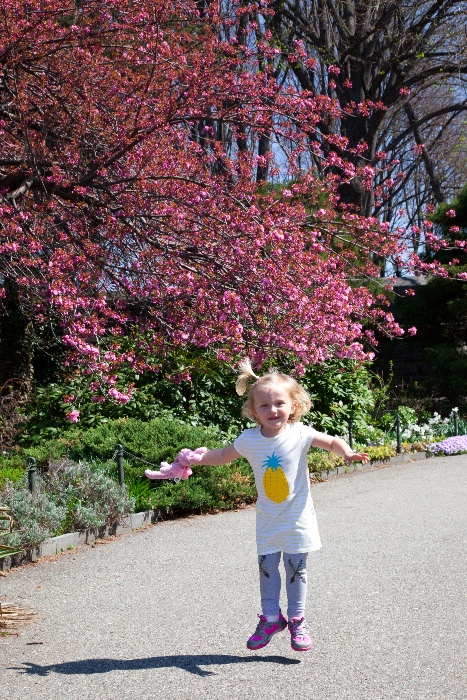 The building and its gardens are located in Fort Tryon Park, in north Manhattan, just a hop, skip and a jump away on the A train. 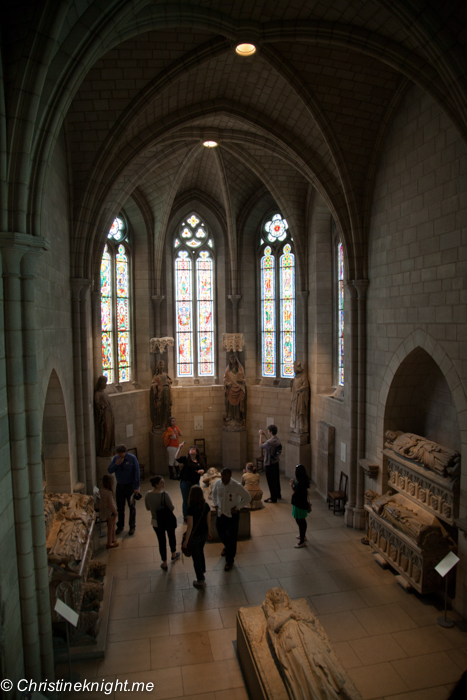 The architecture and artistic works at the Cloisters are largely from the Romanesque and Gothic periods. 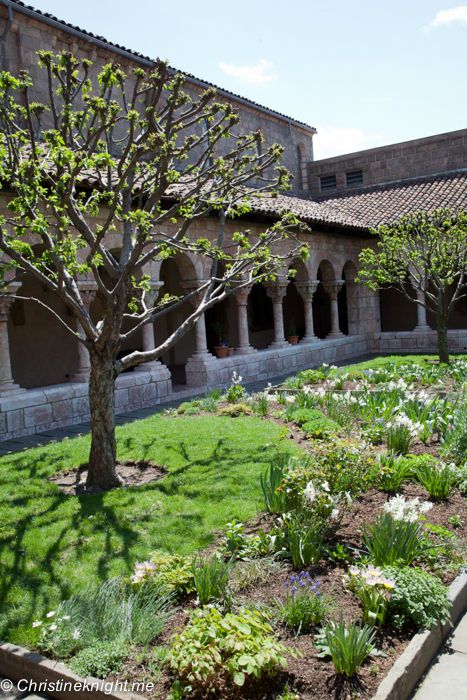 Four reconstructed cloisters, sourced from French monasteries and abbeys, are surrounded by early medieval gardens and a series of indoor chapels and rooms. 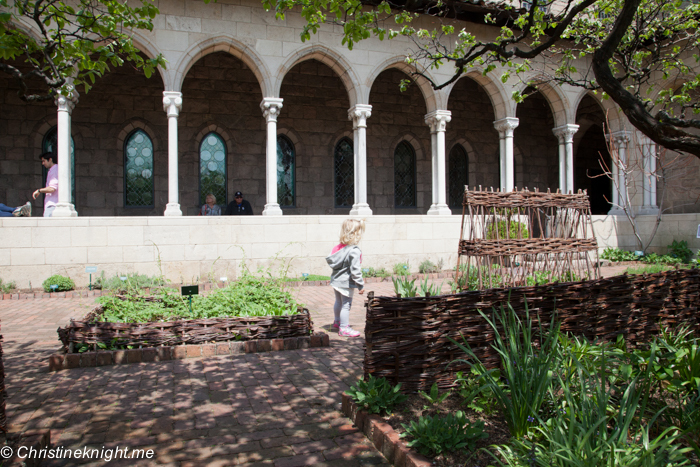 Walking inside the Cloisters feels very much like stroll through Medieval European monastic life. This is by very intentional and clever architectural design combined with the five thousand medieval works of art on display from the Mediterranean and Europe, mostly from the 12th to 15th centuries. 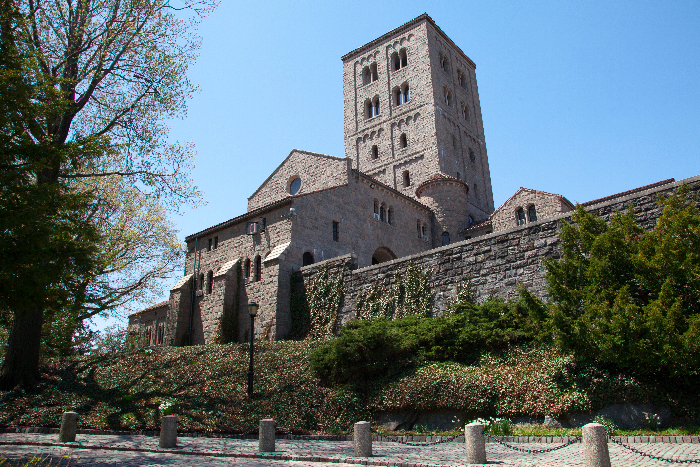 To get to the Cloisters, take the subway to 190th Street station at the base of Fort Tryon and walk from there. 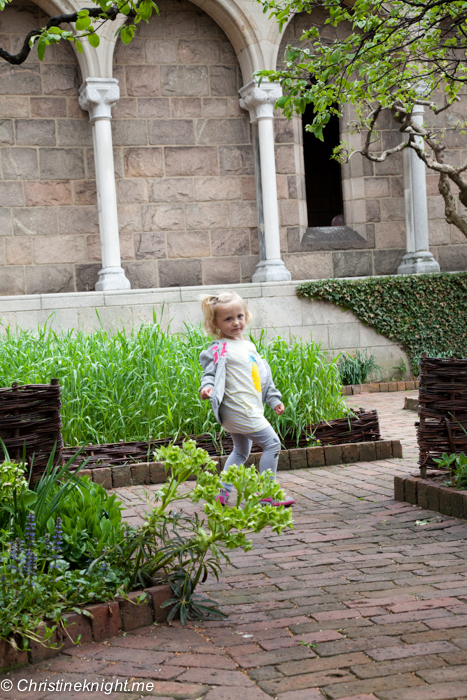 The walk to the Cloisters takes visitors through an herb and flower garden. 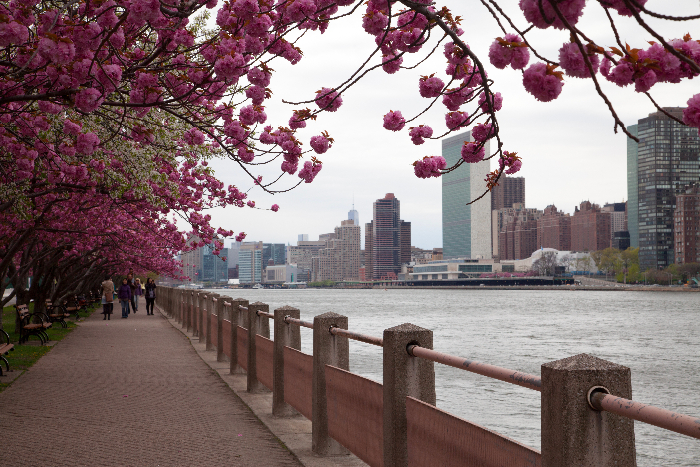 It’s a beautiful place to wander through, especially with the Hudson River as a backdrop. The aren’t a lot of food options in the area. Your easiest options are: 1. 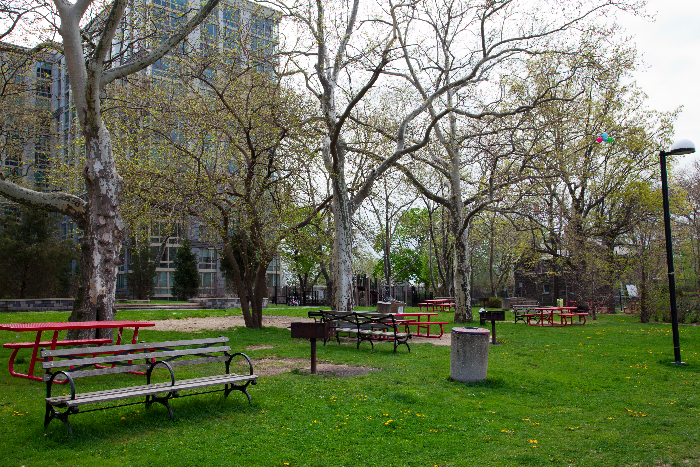 Bring a picnic lunch; 2. Buy a pre-made sandwich or salad from the Cloisters cafe; or 3. A sit-down brunch or lunch at New Leaf Restaurant. We chose New Leaf Restaurant & Bar. 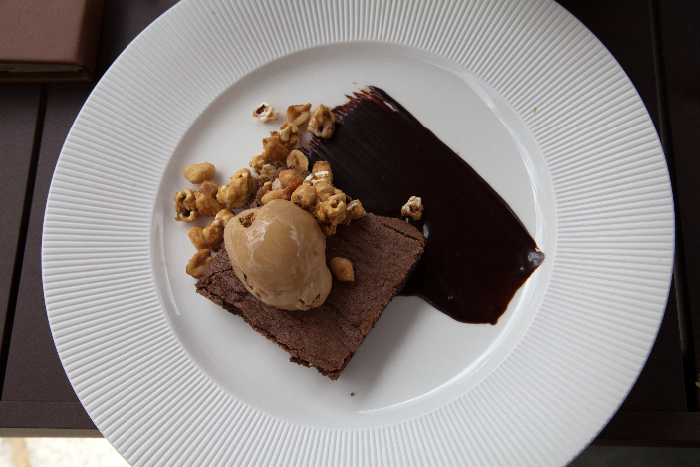 Housed in a 1930s cottage, the restaurant serves modern American cuisine. 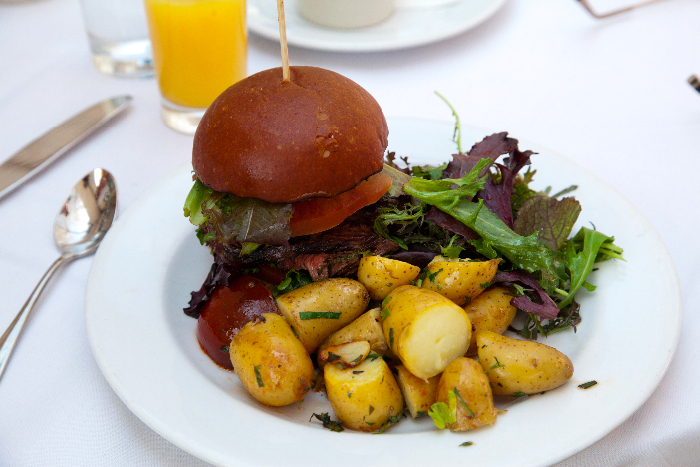 On weekends, brunch is served from 11am-3pm. We were given a table on the bright, airy patio, surrounded by trees. Tres tranquil. While the restaurant is large, it fills quickly, and by 12:30pm it was at capacity. As New Leaf does not take reservations for brunch, get there early. 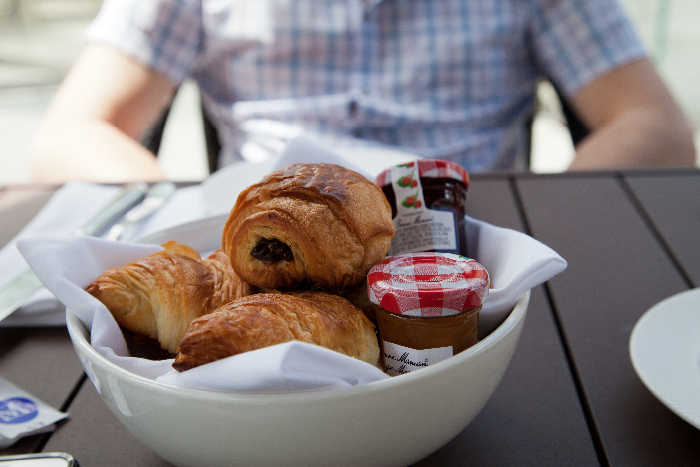 The brunch menu is a pre-fixe at $19.95 for an entree, juice and tea or coffee. We ordered a croissant ($5) for missy E while we looked at the menu in more detail. 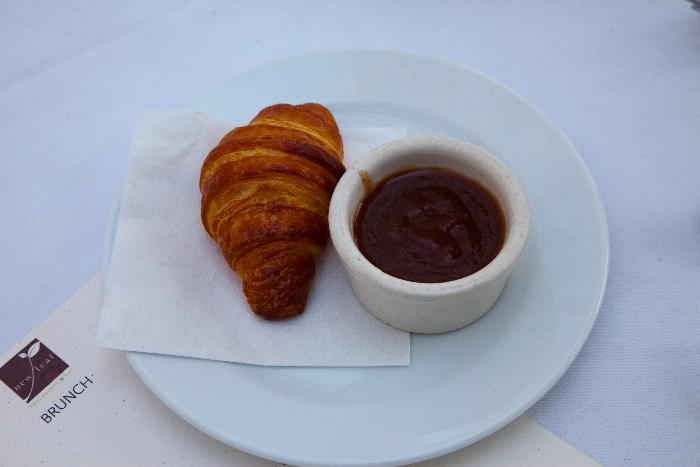 Oddly, the croissant came with chutney. 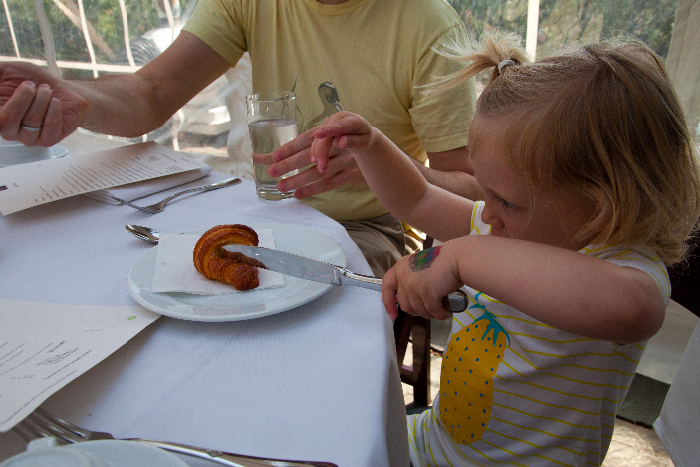 The croissant was absolutely delicious, while on the small side (kid-sized, one might say, except E demanded another, making it the most expensive croissants we had ever ordered). 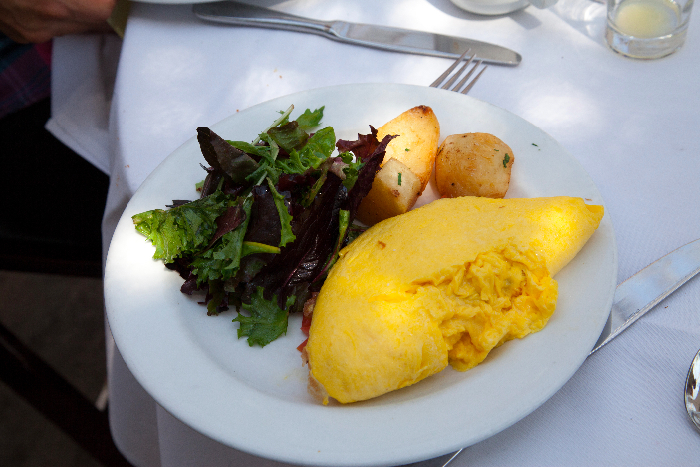 Our group ordered New Leaf Scrambled Eggs (goat cheese, scallions, roasted potatoes, field greens), the Market Omelette (tomatoes, peppers, onions and your choice of cheese, with herbed-roasted potatoes, field greens) and the Hanger Steak Sandwich (with salad and potatoes). 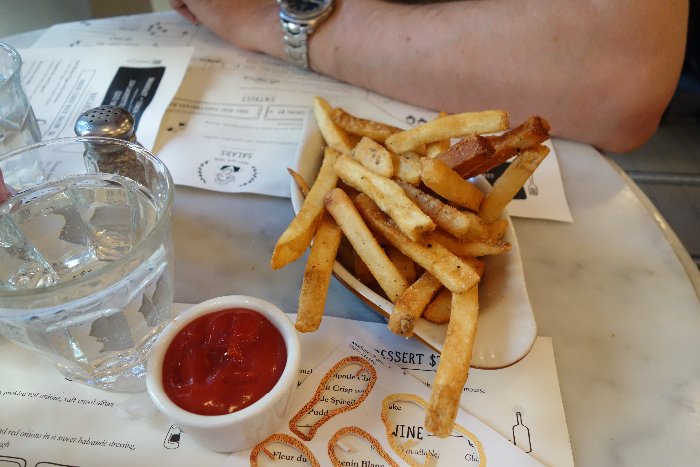 The portions for the most part were large by New York standards, and we all struggled to finish our meals. 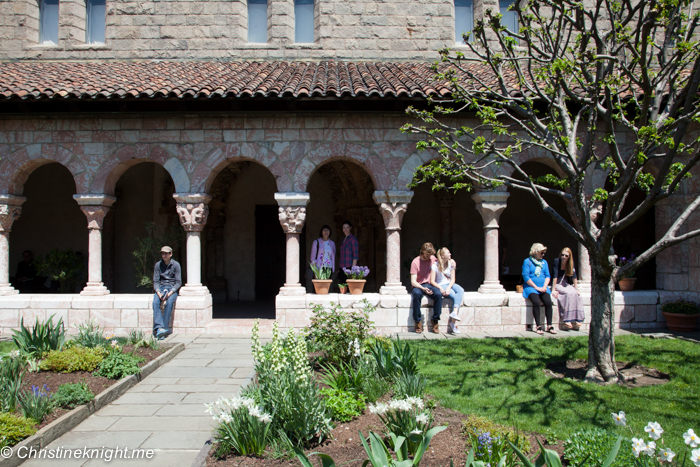 A short stroll through beautiful Fort Tryon Park takes you to The Cloisters. 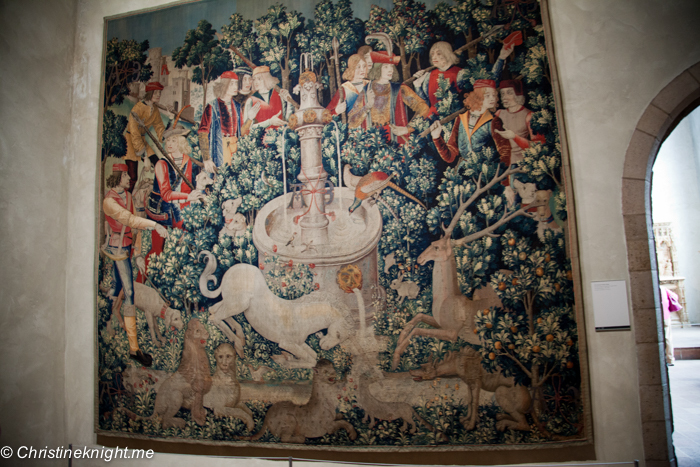 My favourite part of the Cloisters was the Unicorn Tapestry collection. These seven individual pieces are among the most beautiful and complex works of art from the late Middle Ages that survive today, woven from fine wool and silk with silver and gilded threads. 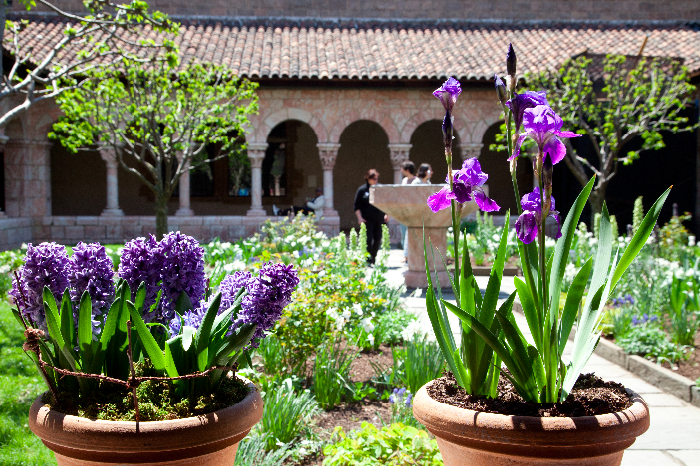 Spring is the best time to visit The Cloisters as the gardens are in full bloom. The famous garden you see in all the photographs is filled with bright flowers and a fountain centerpiece. The lower-level garden is home to plants one would have found in a garden in the middle ages, like herbs and vegetables. Take the time to explore the garden and the different plants on display – many of which you’ll be hard-pressed to find elsewhere. The purpose of the plants is explained throughout the garden: medicinal (like St. John’s-Wort, Hollyhock, MarshMallow, Meadow Clary, Liquorice, Comfrey, and Feverfew), magical (such as Bear’s Foot, Ragged-Robin, English Ivy, Cornelian Cherry, and Herb Robert) or for use in the kitchen (herbs like Winter Savory, Leek, Cardoon, Samphire, Chive, Small-Leaved Basil, and Red Valerian). As it was an herb garden and all the plants had such unique scents, we got down close to the gardens and smelled the aromatic plants such as spearmint and lavender. We timed our visit so Cheese would nap in the stroller after lunch, so we were able to see most of The Cloisters before she woke up. Which was a good thing, as the museum is not so friendly for smaller kids. Babies in carriers and older children are the ideal candidates for this cultural experience. There are lots of tiny stairwells and no ramps or elevators. You can’t leave strollers unattended. No food/water anywhere except in the cafe (including the gardens). 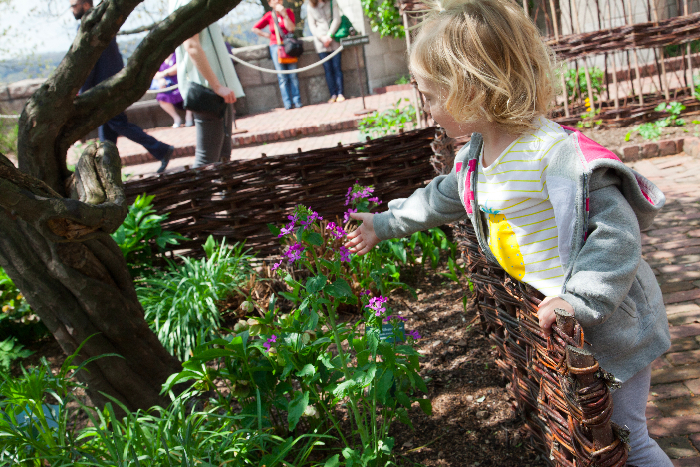 Within the gallery rooms, keep children close as there are lots of fragile objects around. 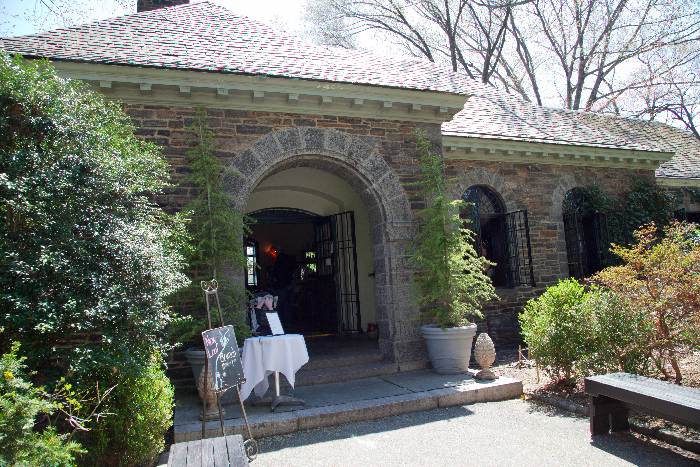 To get to the Cloisters, take the subway to 190th Street station at the base of Fort Tryon. 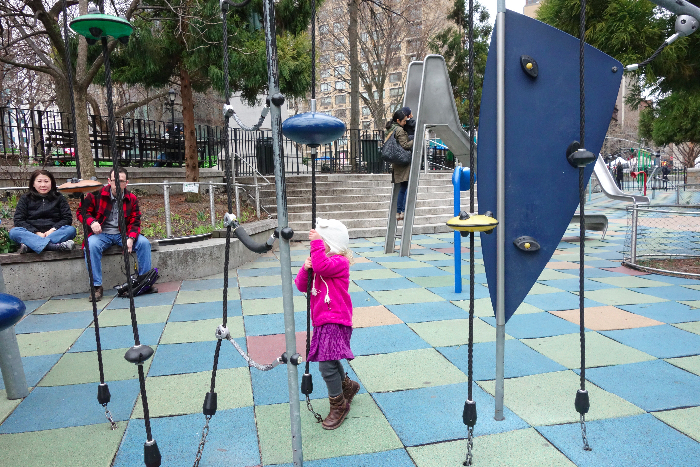 Directly outside of the station entrance is the Jacob K. Javits Playground, where we let Cheese run off steam before brunch. It’s a nice playground with swings, several climbing structures for children of all ages, and also space for scooting or basketball.